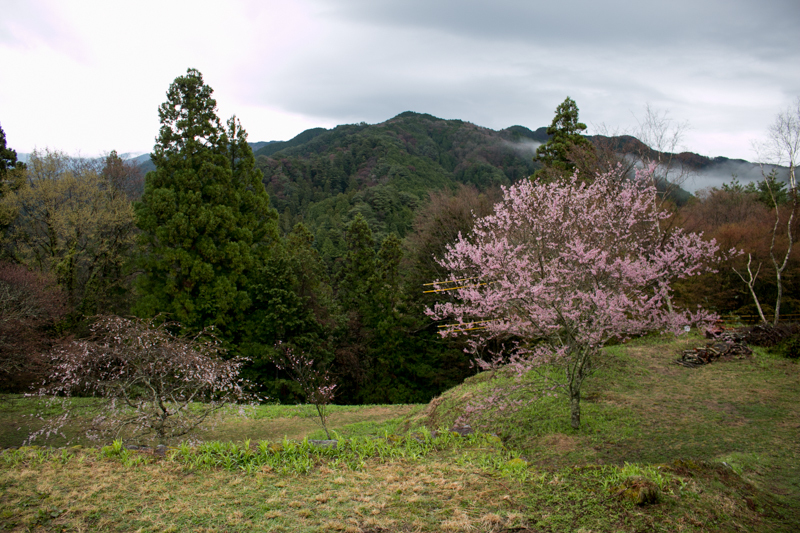 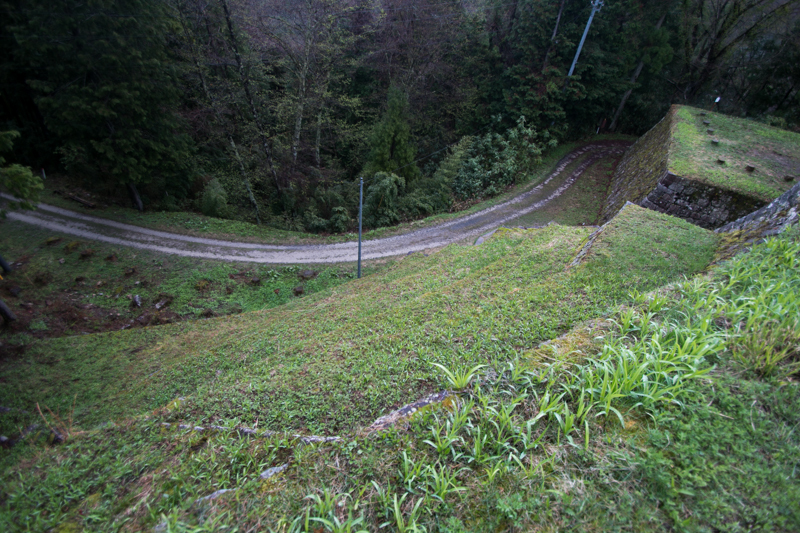 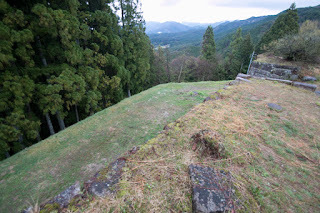 Iwamura castle (岩村城) is located on a steep mountain looking down on Iwamura basin, in Iwamura town at eastern Mino province (Gifu prefecture). 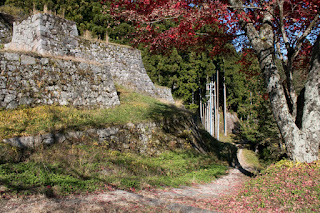 Iwamura town is a starting point of a road to Houraiji and Toyohashi, eastern part of Mikawa province (eastern part of Aichi prefecture), and this way intersects Sanshu Kaido road, a main route of at that time connected southern edge of Shinano province (Nagano prefecture) and Okazaki city, the center of middle part of Mikawa province. 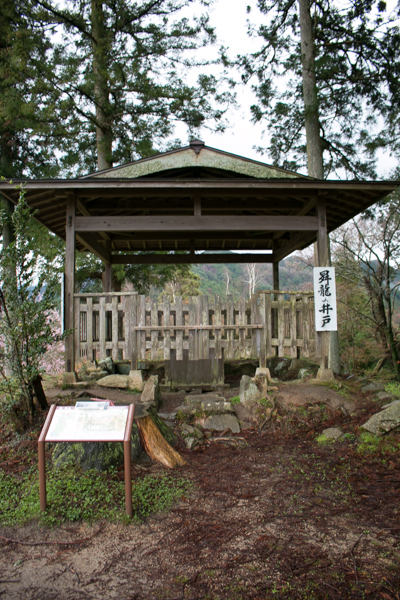 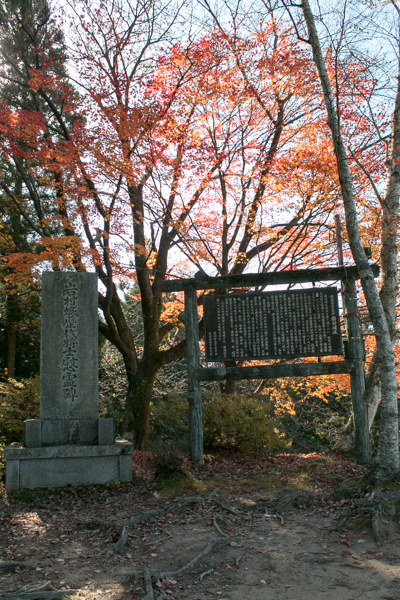 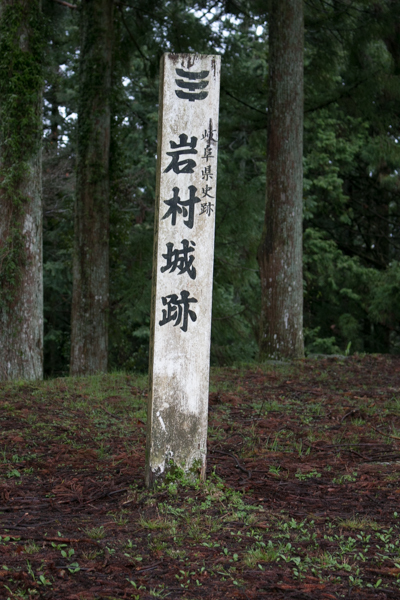 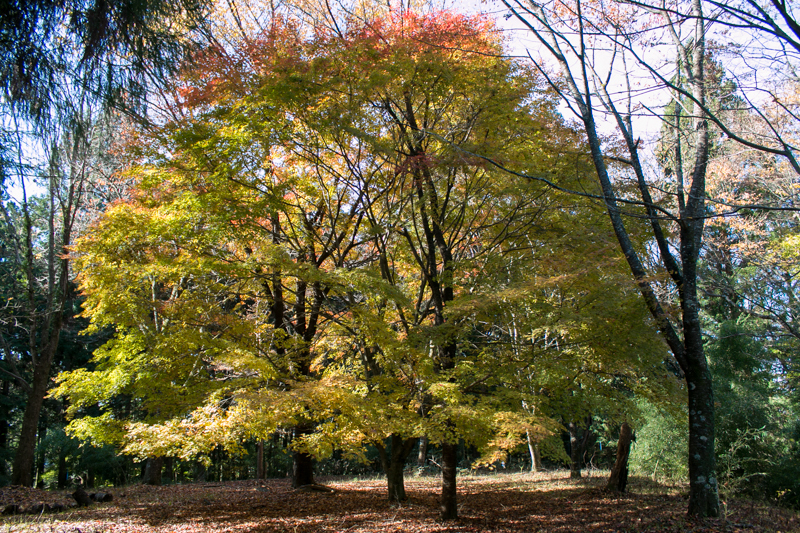 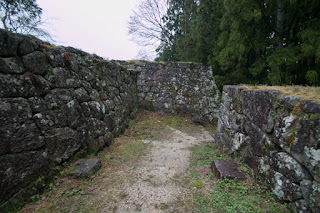 Thus Iwamura area was an entrance to eastern Mino province from Shinano province, Mikawa province or Totomi province (western part of Shizoka prefecture. 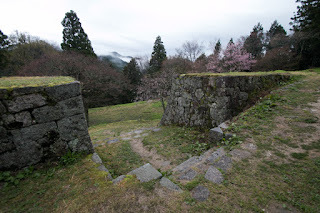 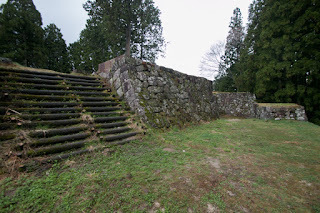 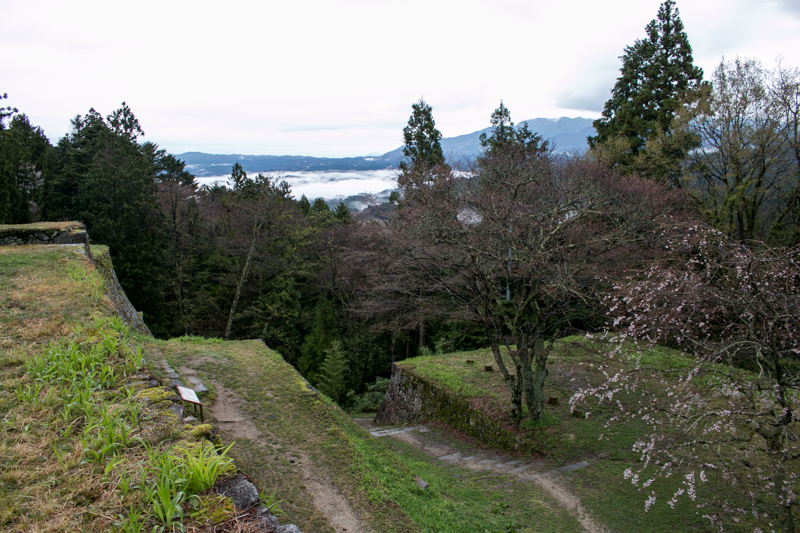 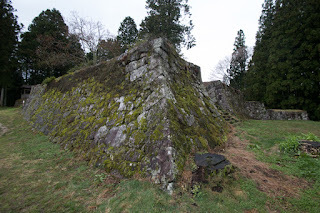 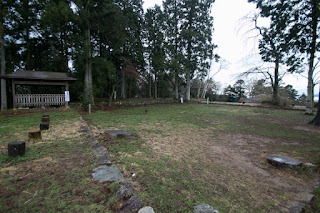 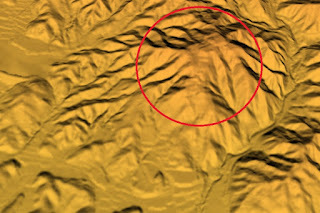 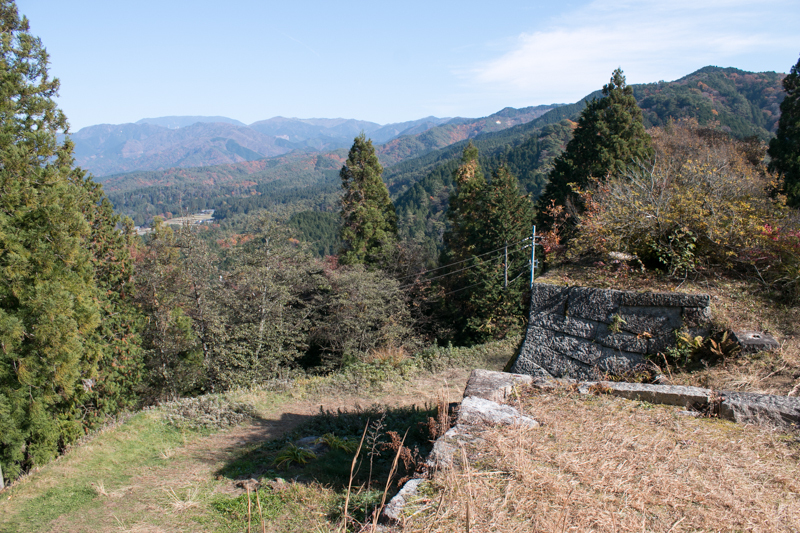 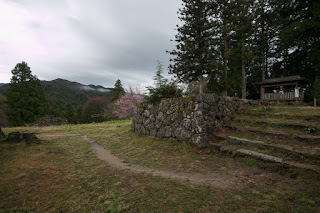 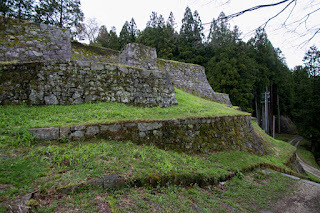 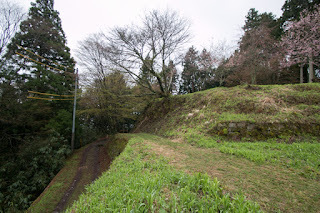 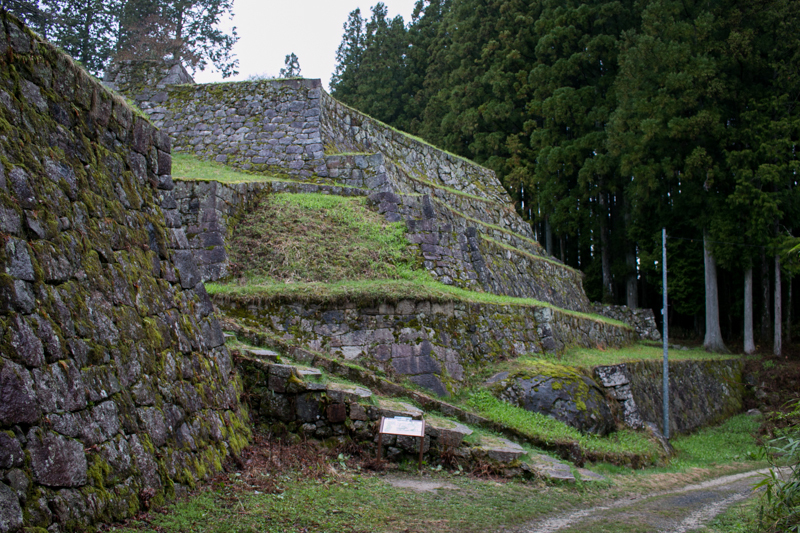 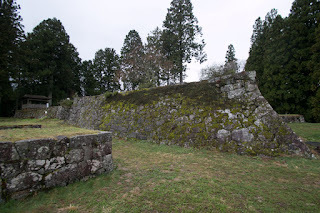 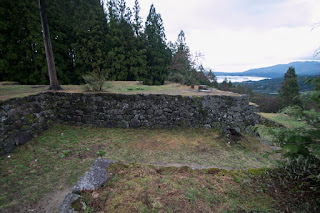 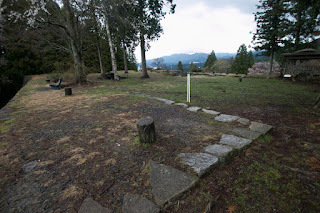 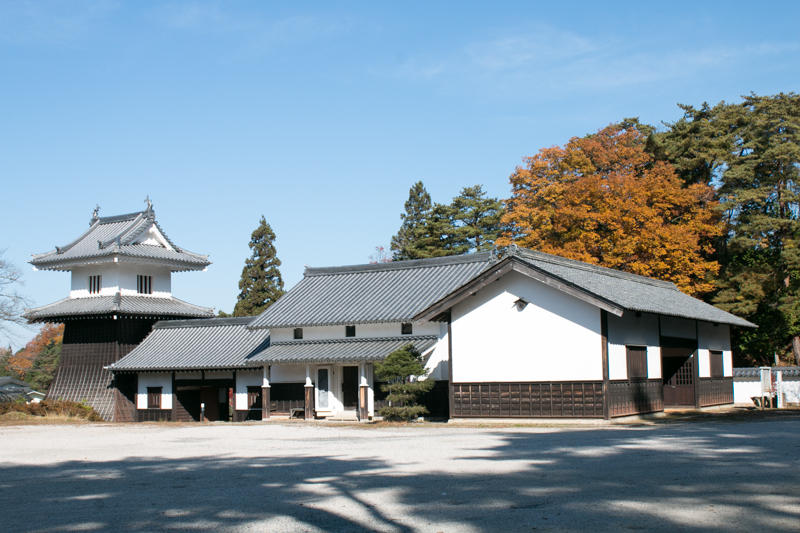 Due to its geographical situation, Iwamura castle was inevitably involved in the battle of Shingen Takeda (1521-1573), a warlord of Kai province (Yamanashi prefecture) who held Shinano province and Nobunaga Oda (1534-1582), who was the lord of Owari province also held Mino province. 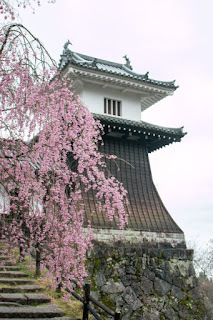 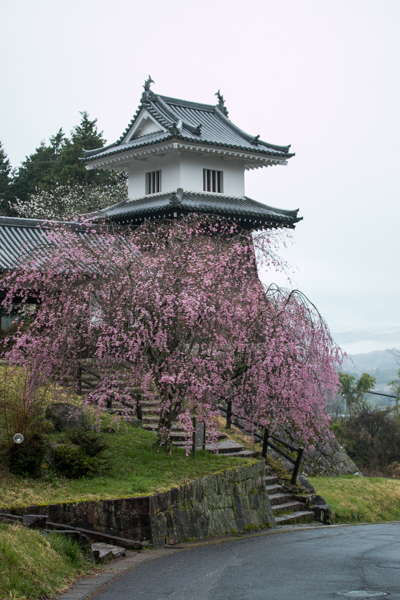 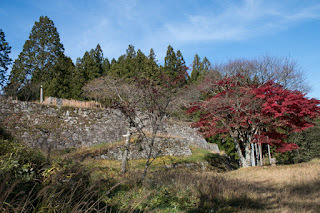 Iwamura castle is also known as one of three excellent mountain castles, along with Takatori castle (Nara prefecture) and Bicchu Matsuyama Castle (Okayama prefecture). 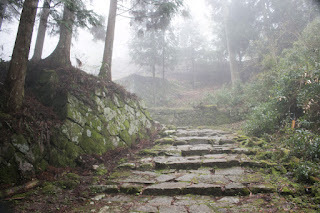 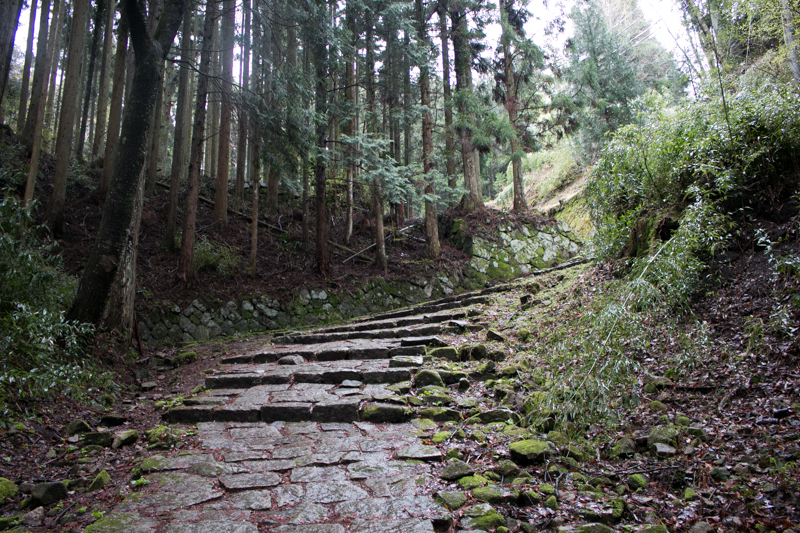 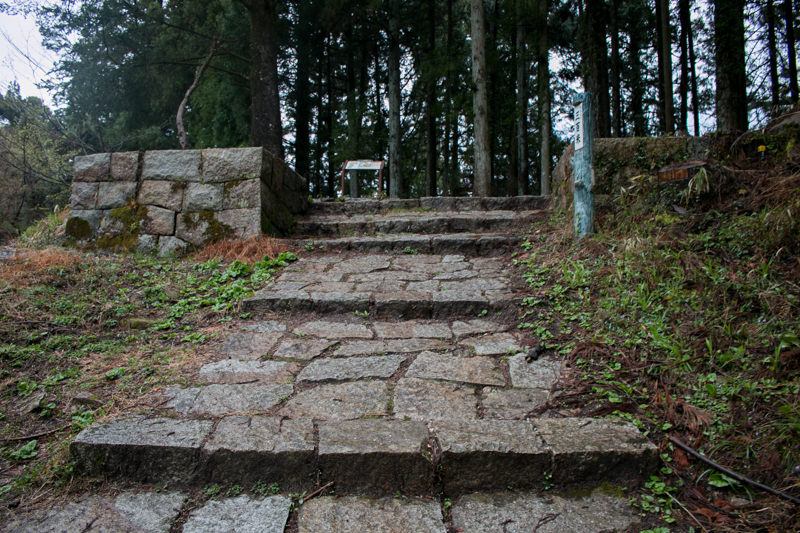 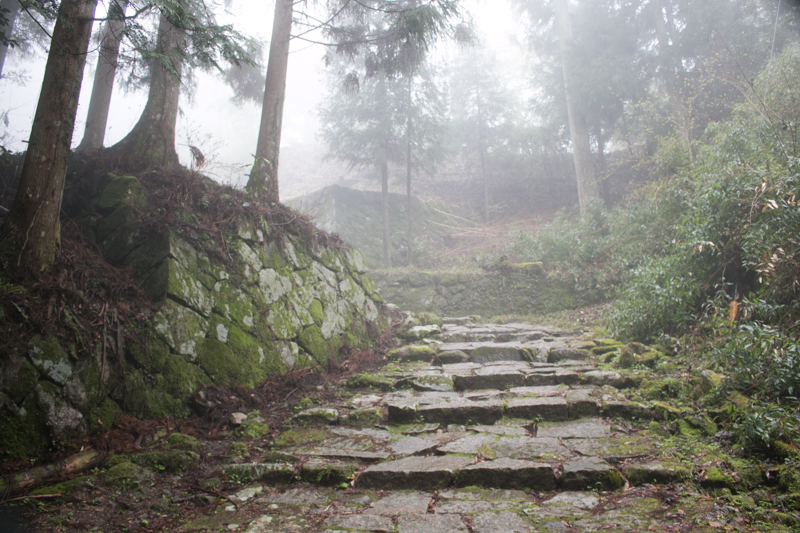 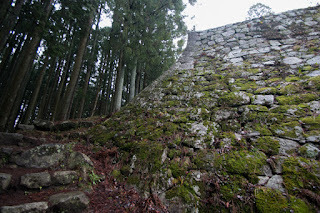 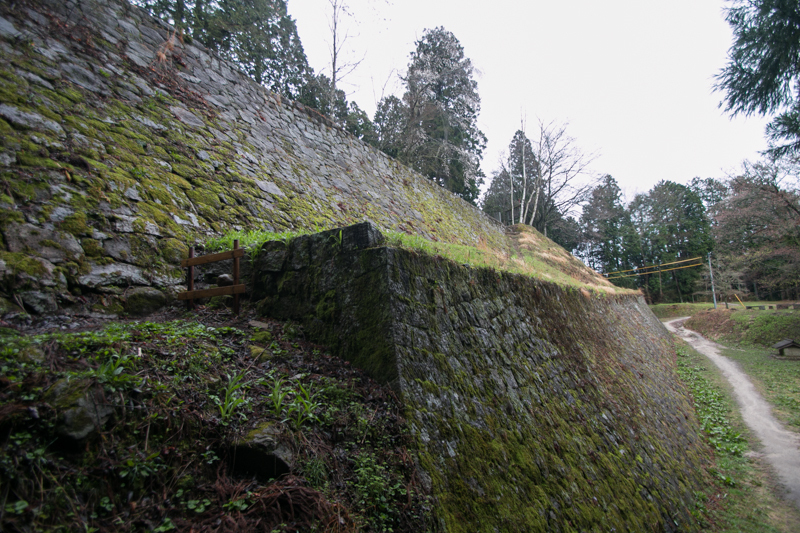 The height of the castle is 721 meter above sea, and the highest modern castle in Edo era. 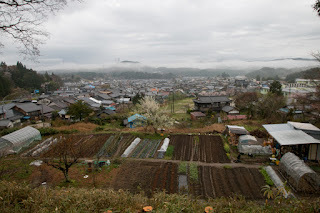 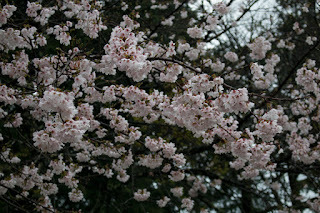 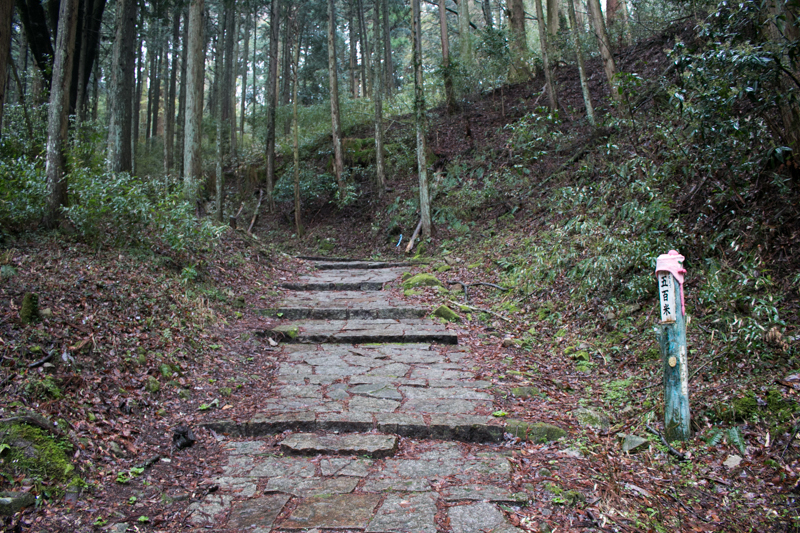 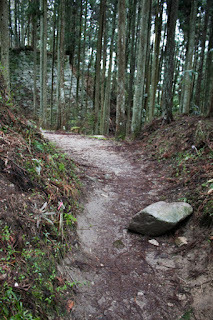 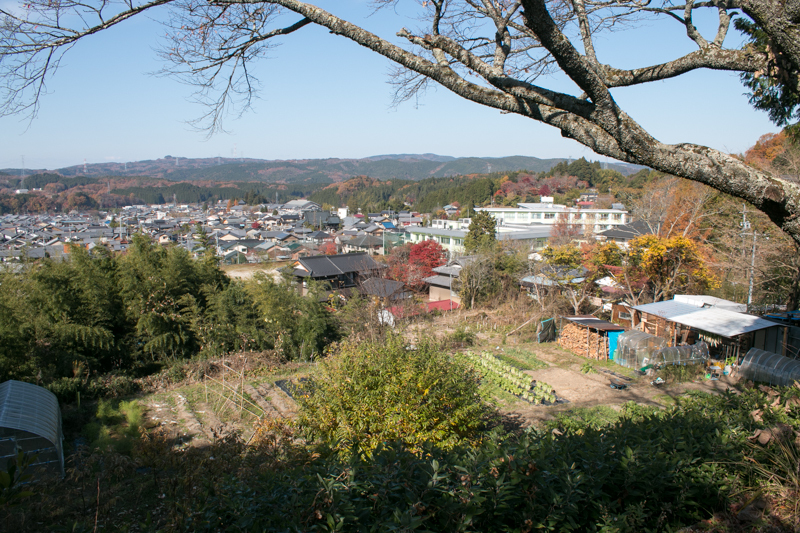 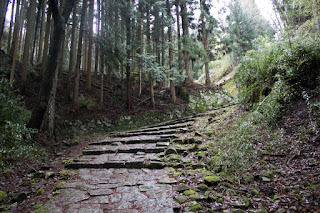 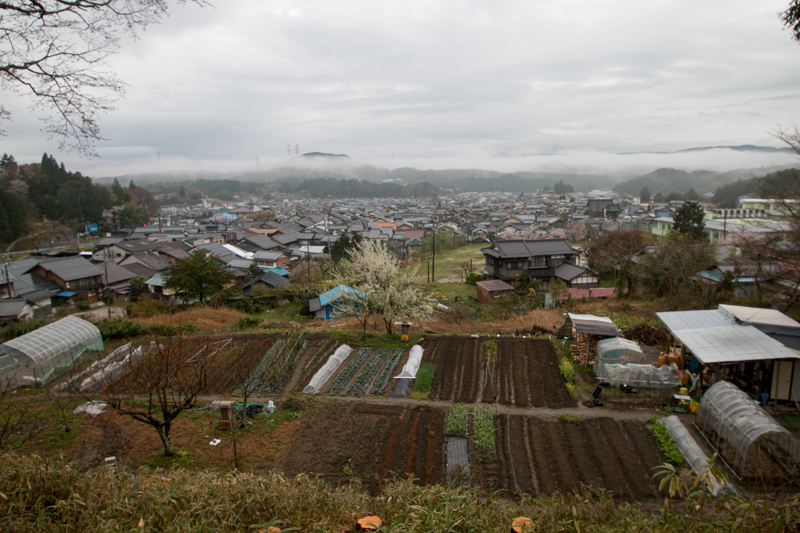 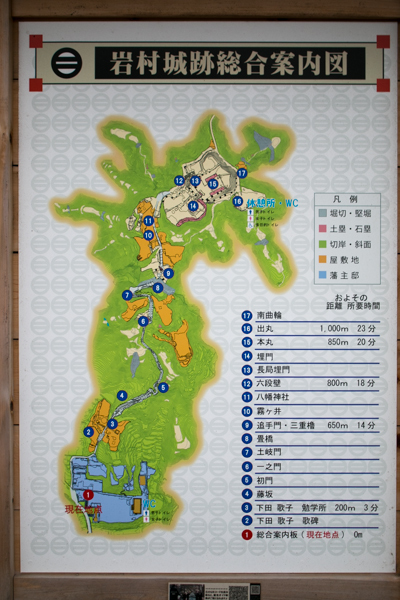 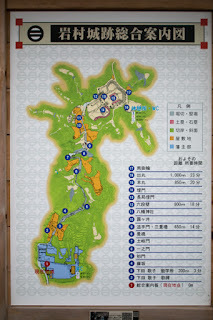 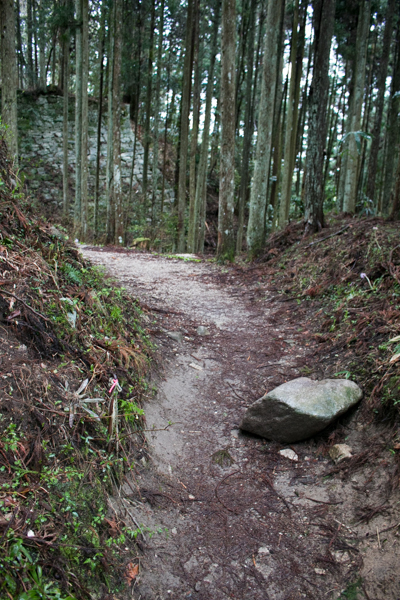 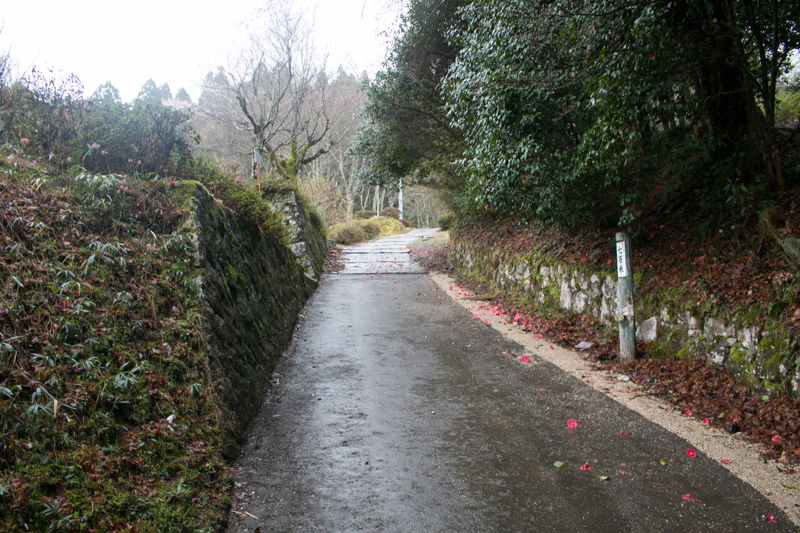 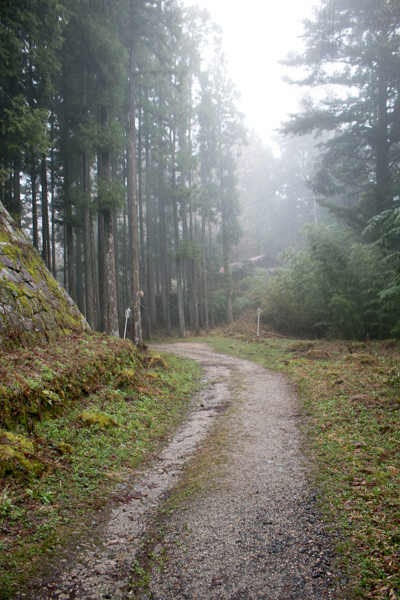 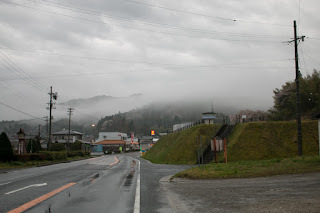 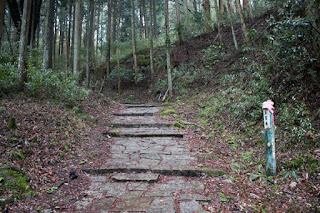 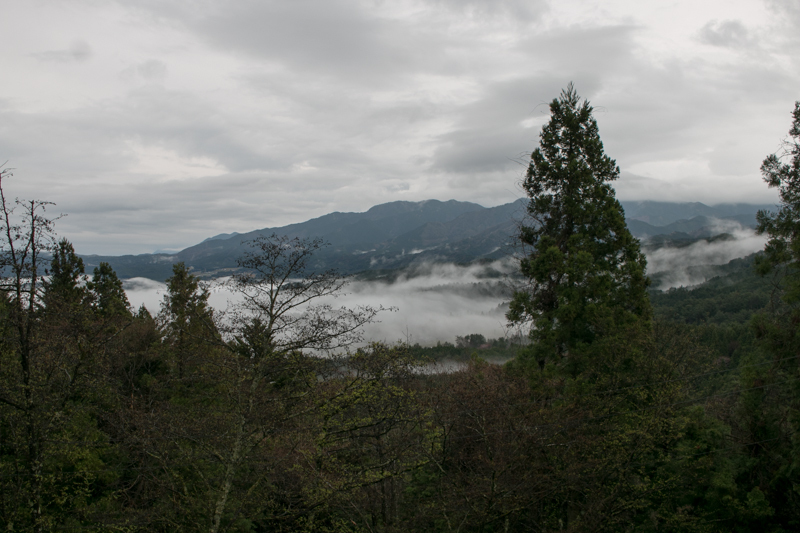 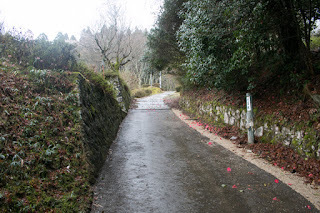 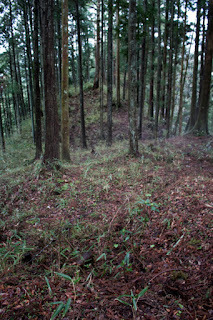 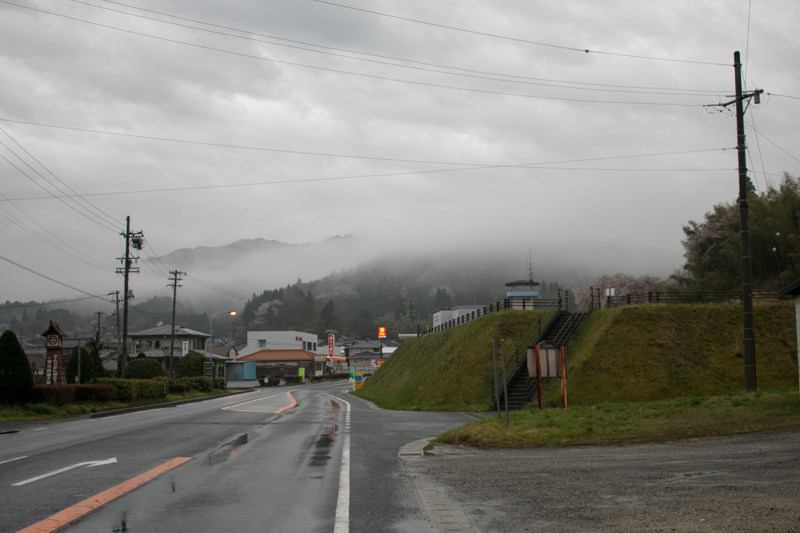 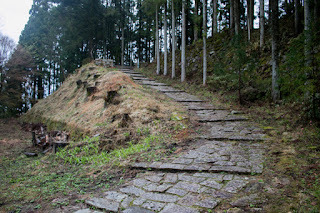 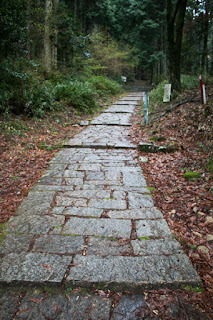 Iwamura town itself is located in an mountainous area and the actual height from the hillside is about 200 meter, but to get to the central area it is necessary to walk an uphill road for 1km. In the medieval era, eastern Mino area was governed by Toyama clan, stem from Kagekado Kato (1156-1221), a retainer of Kamakura shogunate. 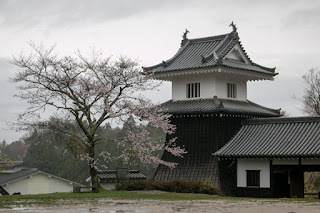 Toyama clan divided into each branch family and held their own castles such as Naeki Toyama clan at Naegi castle, and Iwamura Toyama clan was the head family of whole Toyama clan. 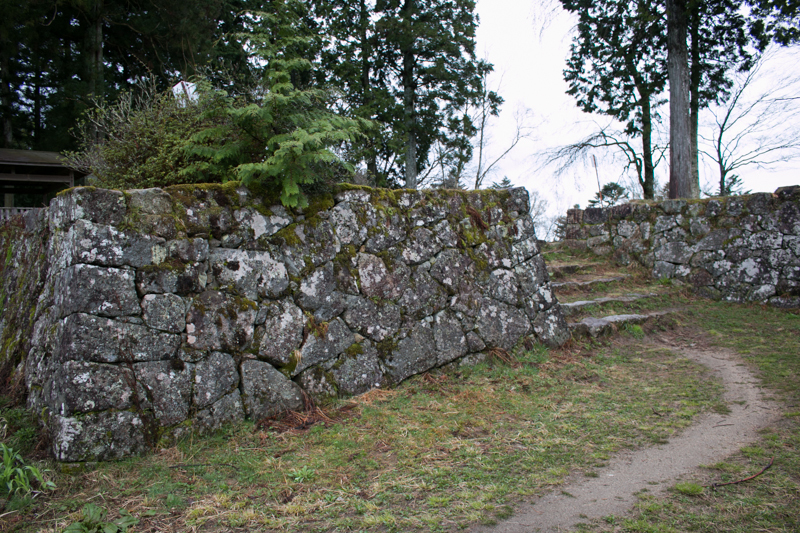 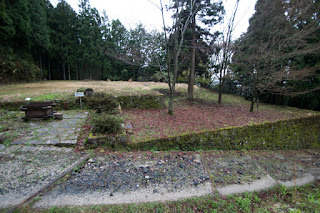 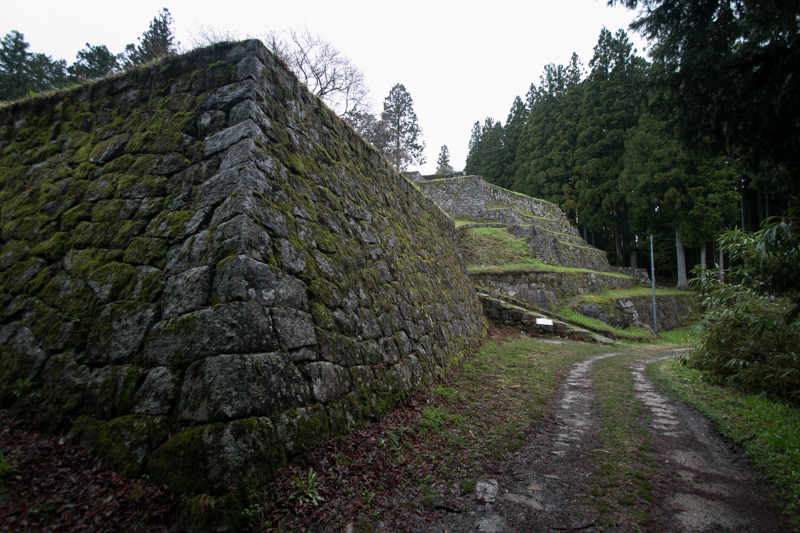 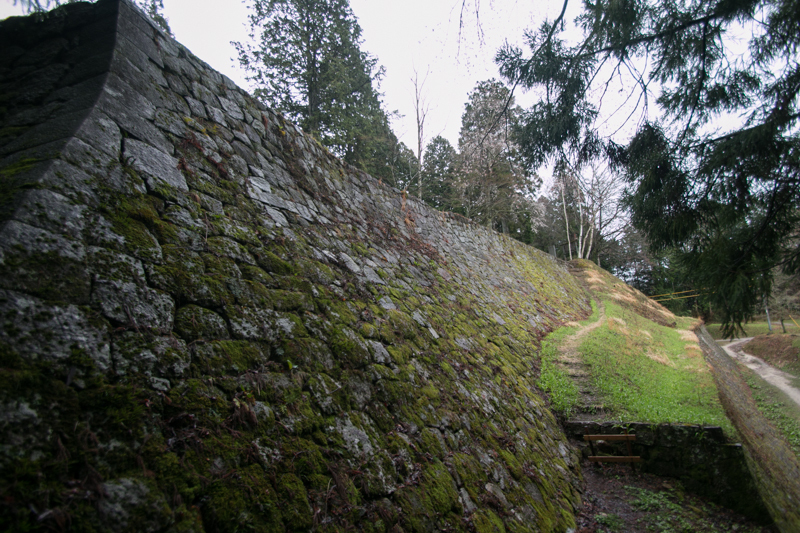 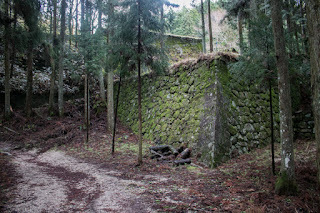 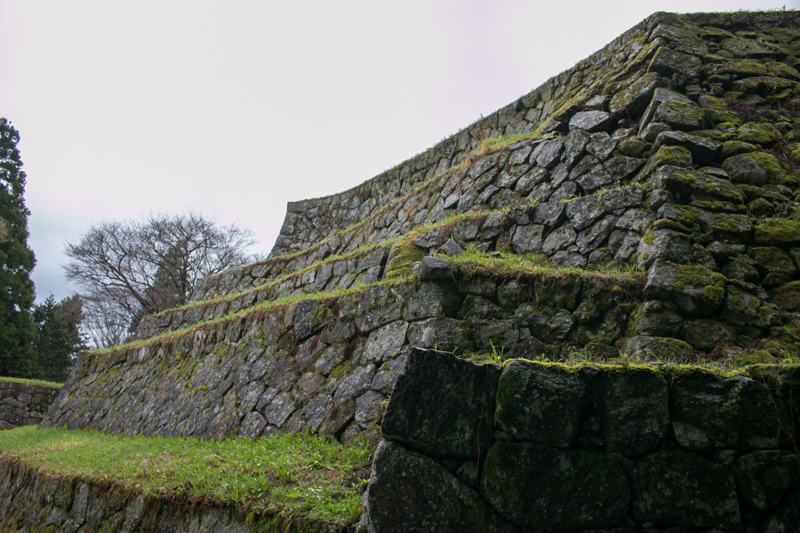 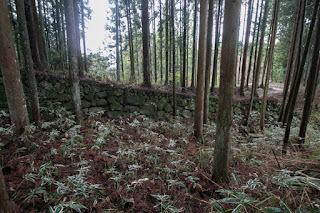 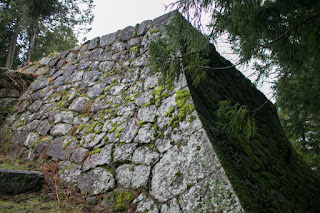 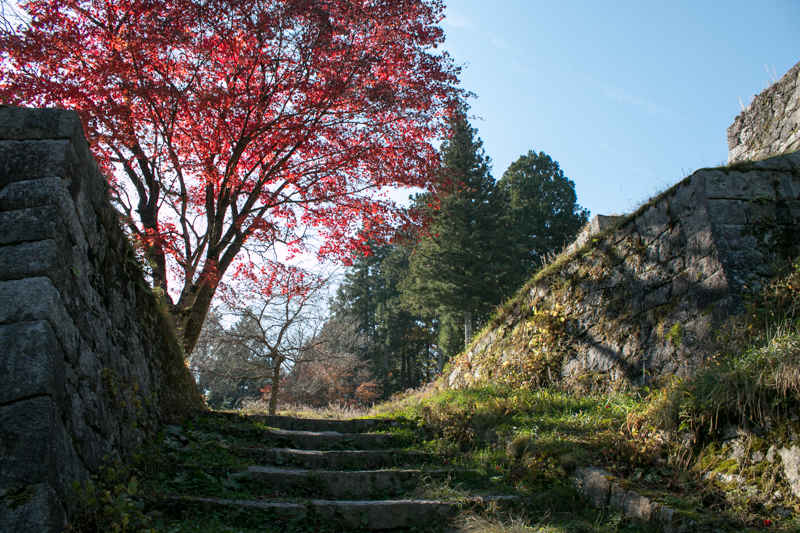 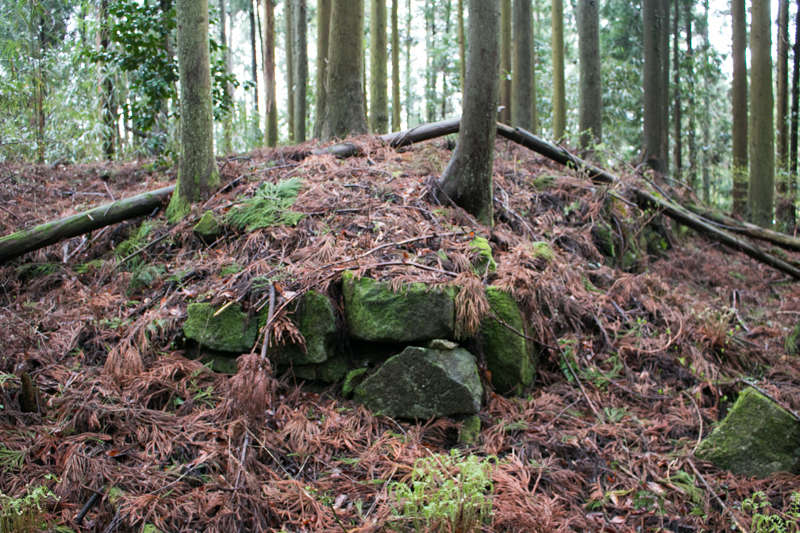 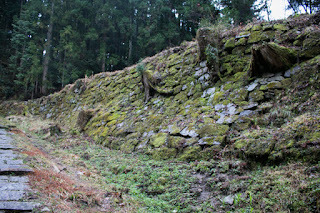 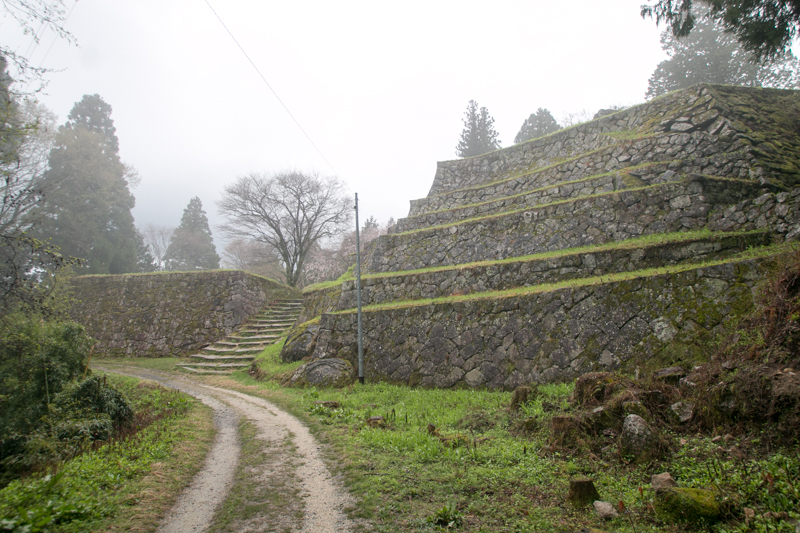 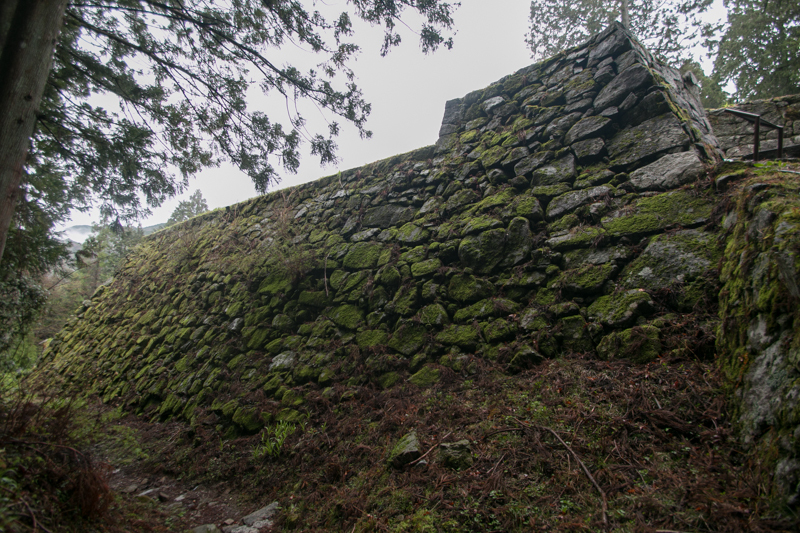 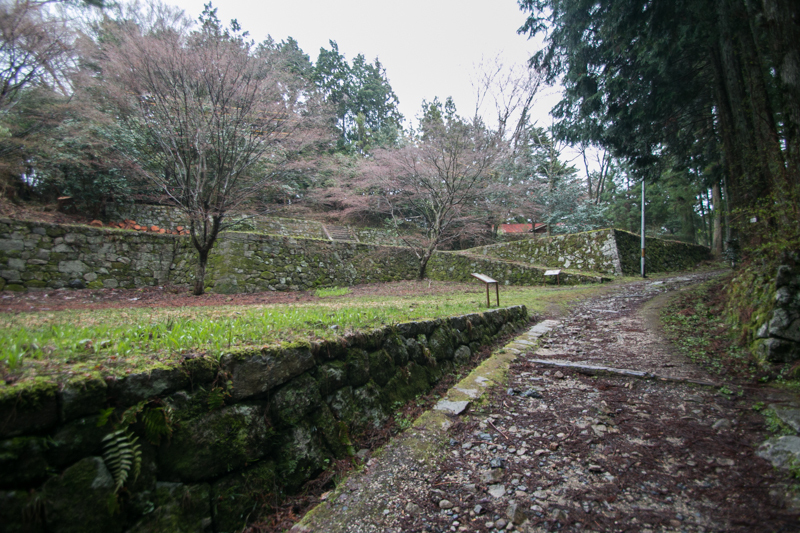 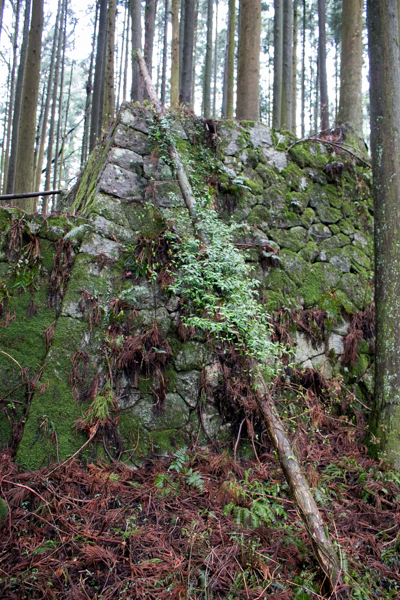 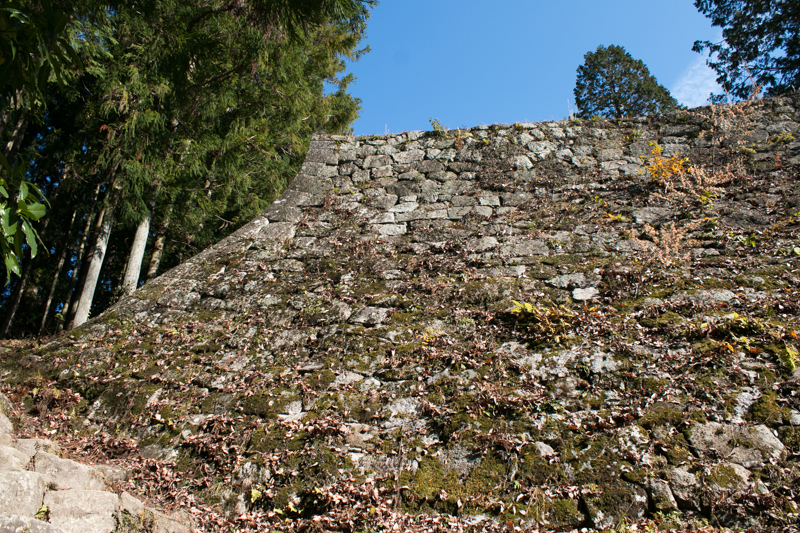 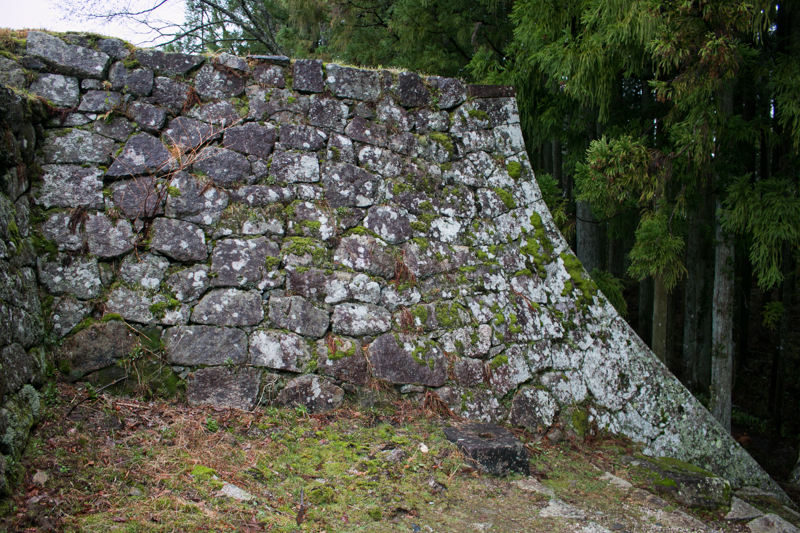 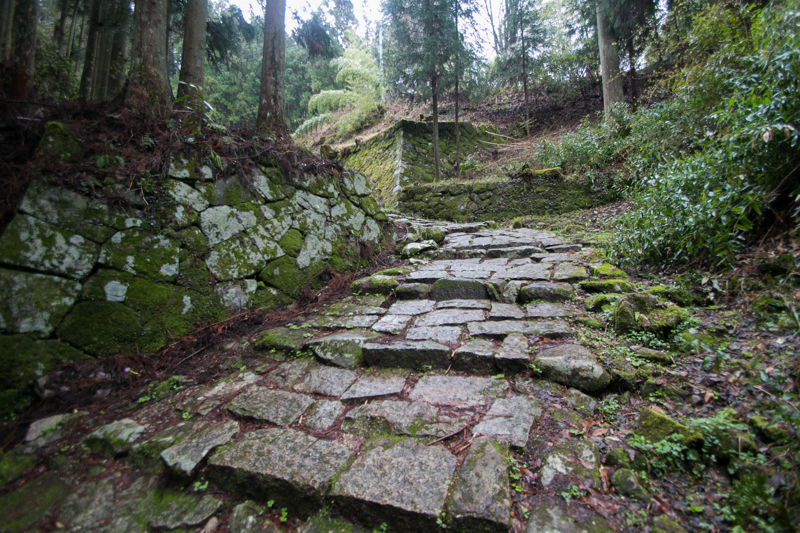 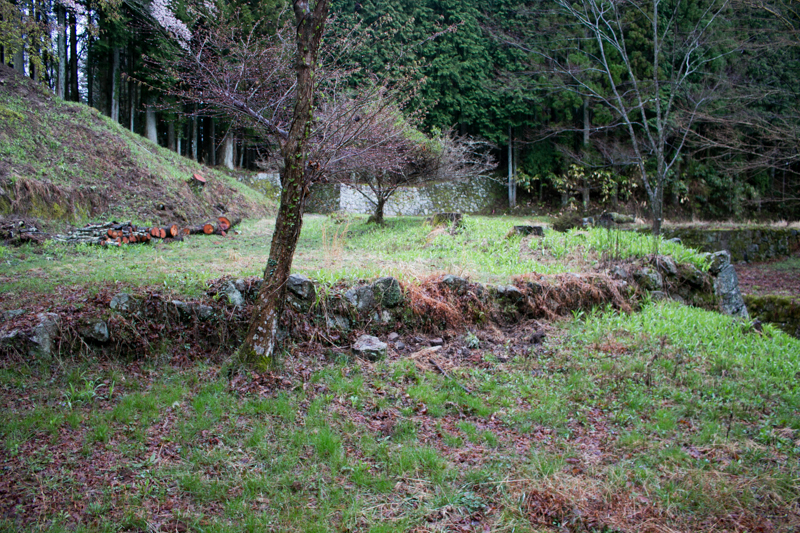 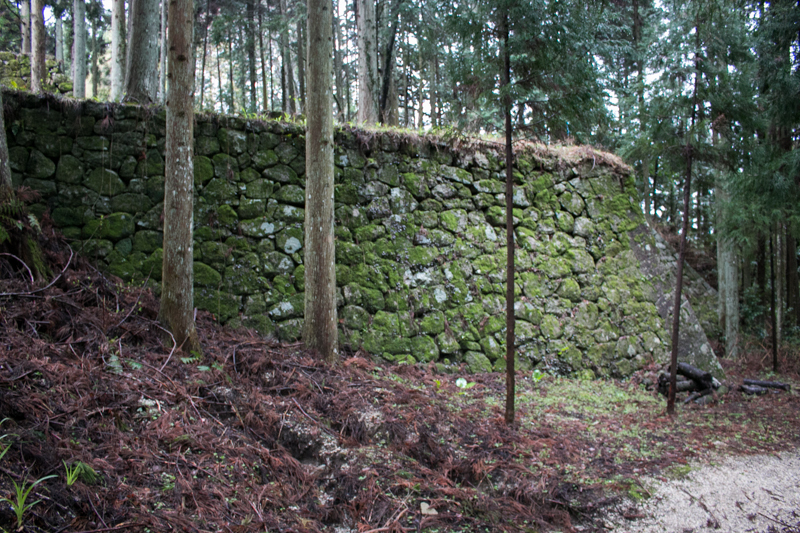 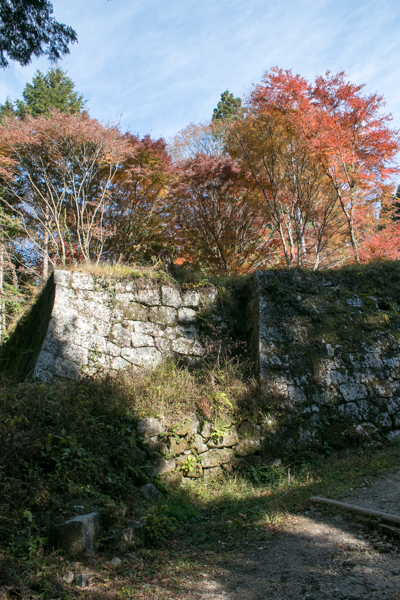 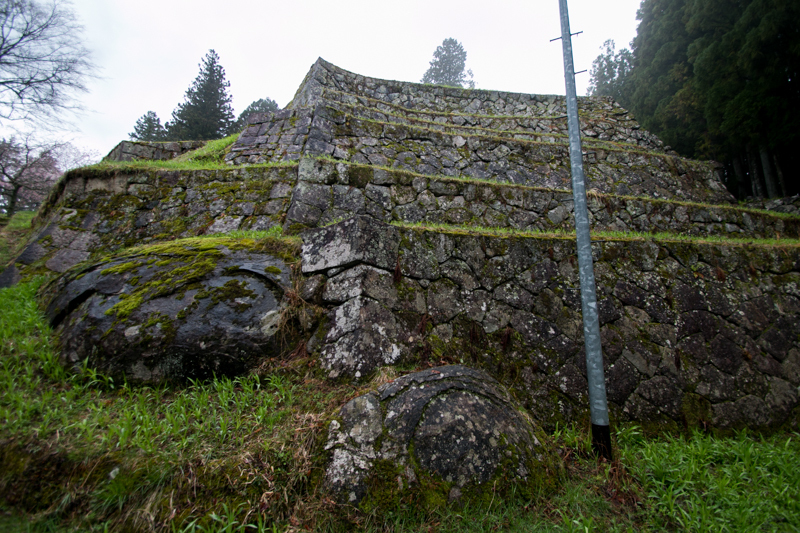 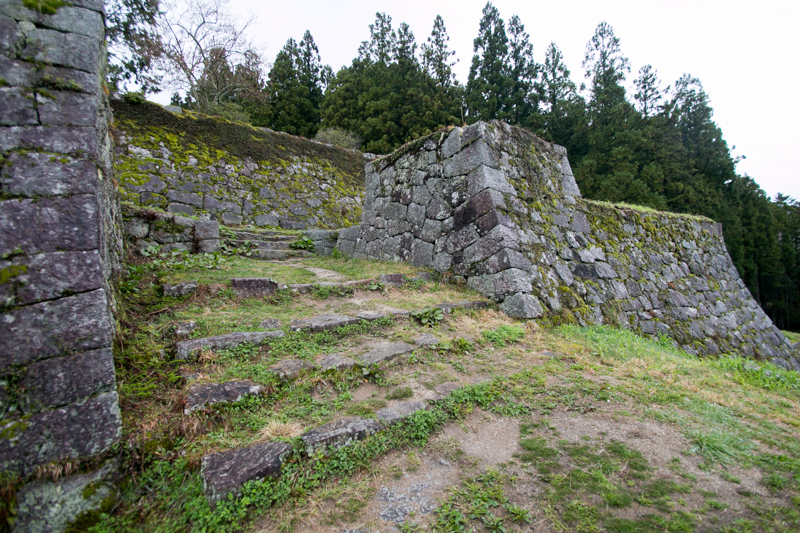 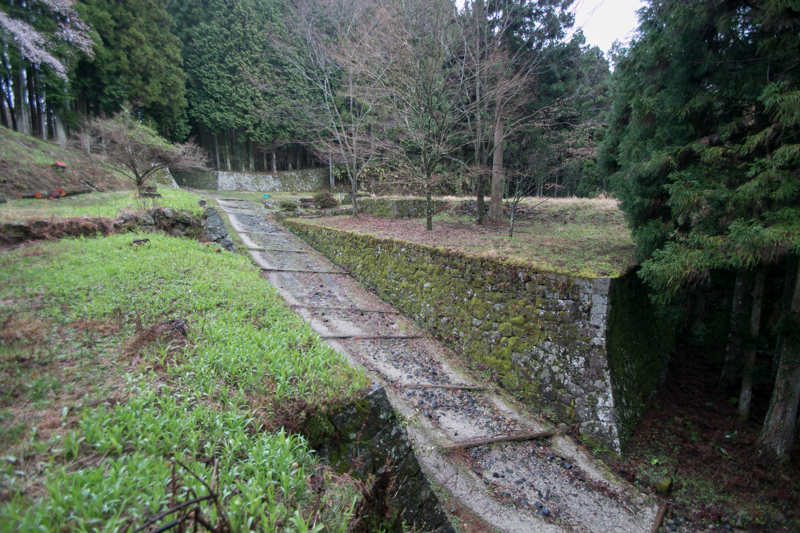 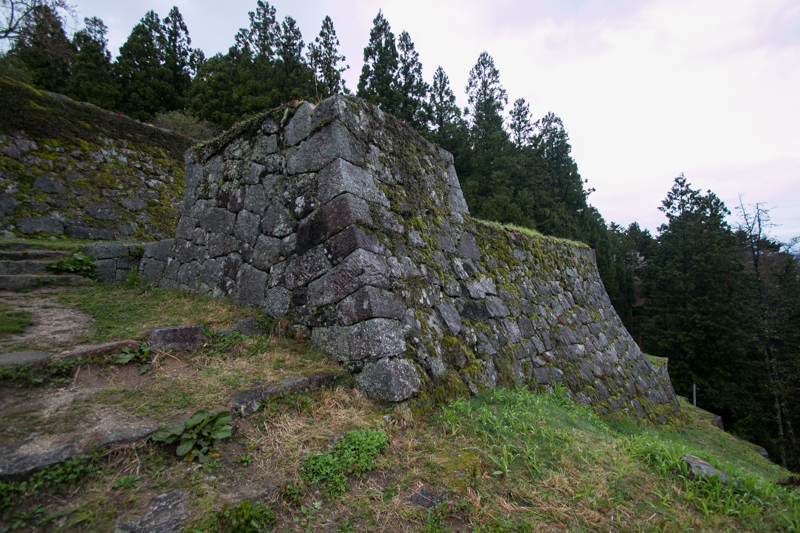 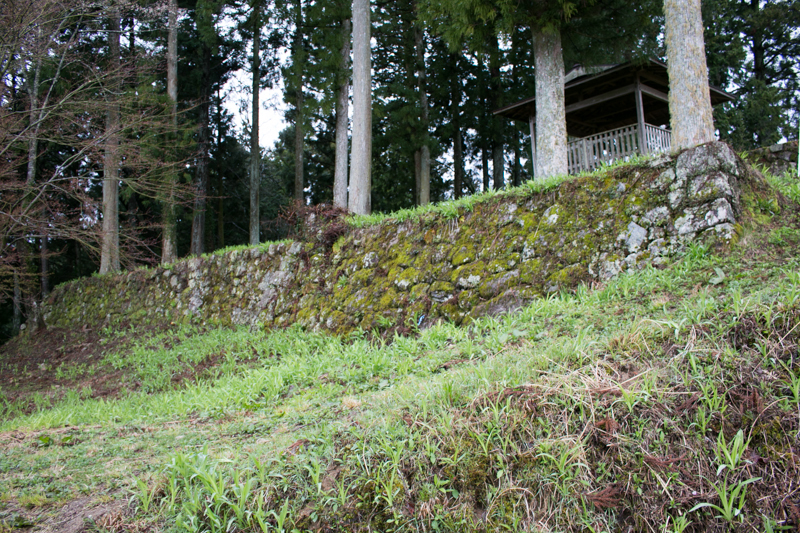 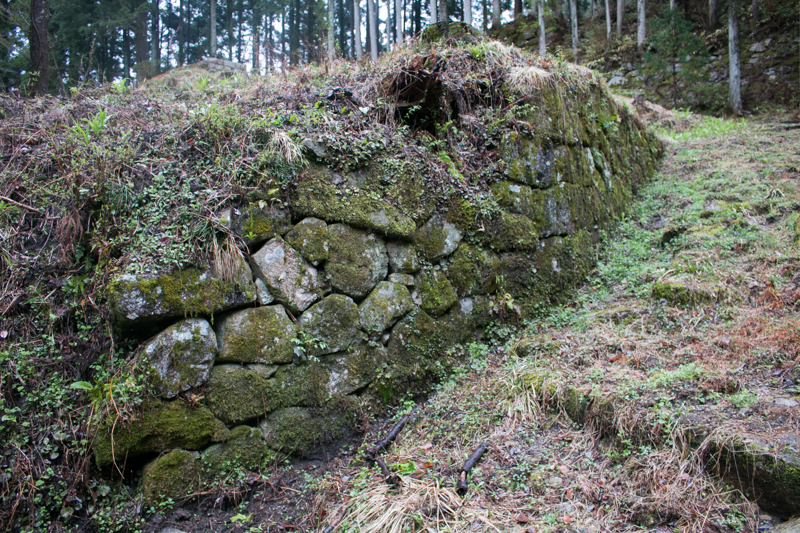 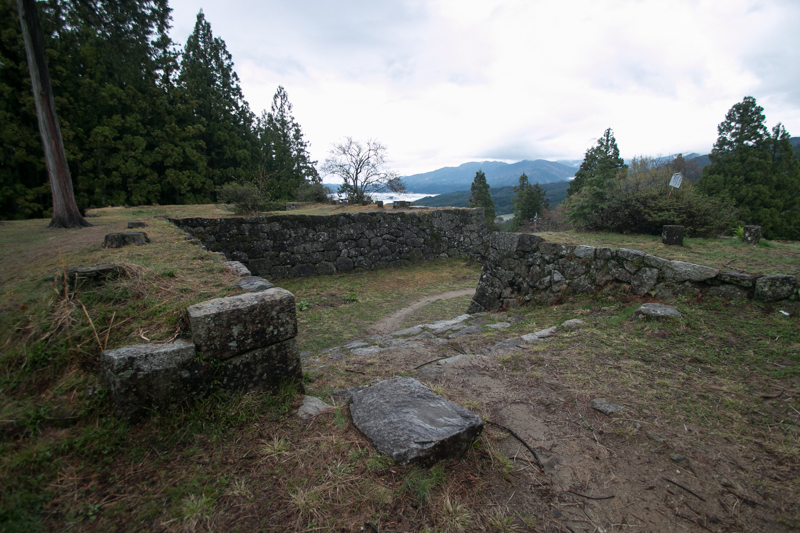 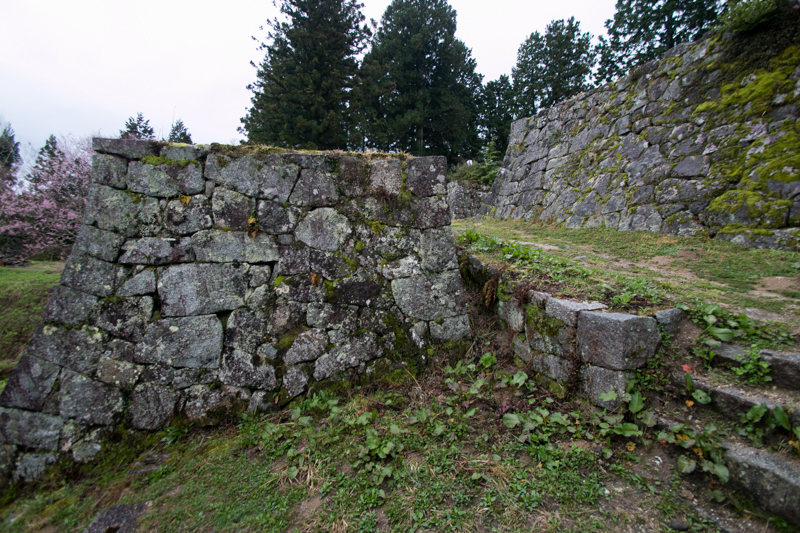 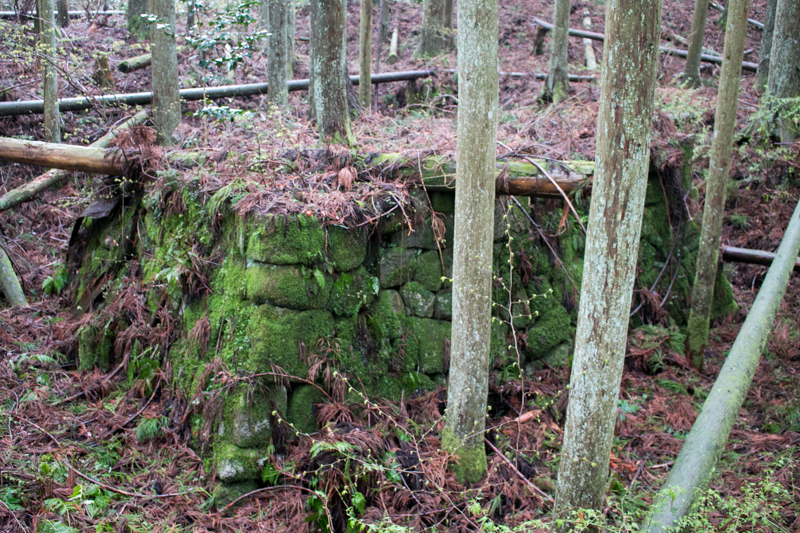 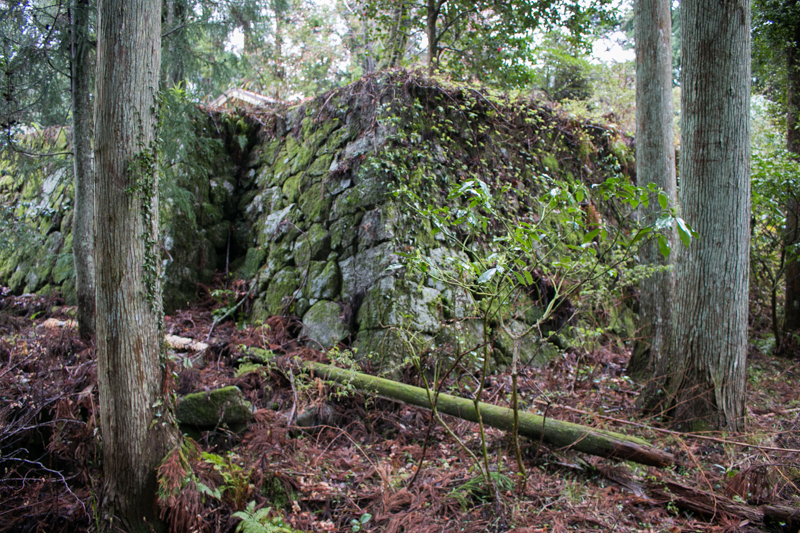 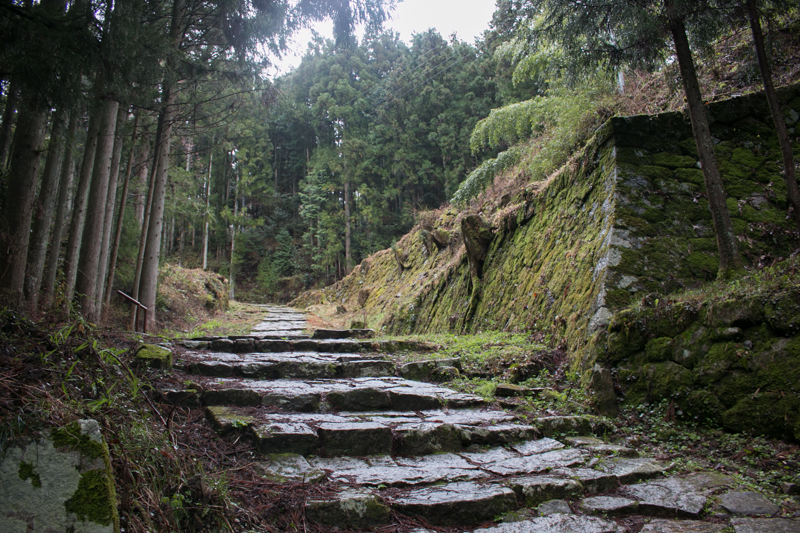 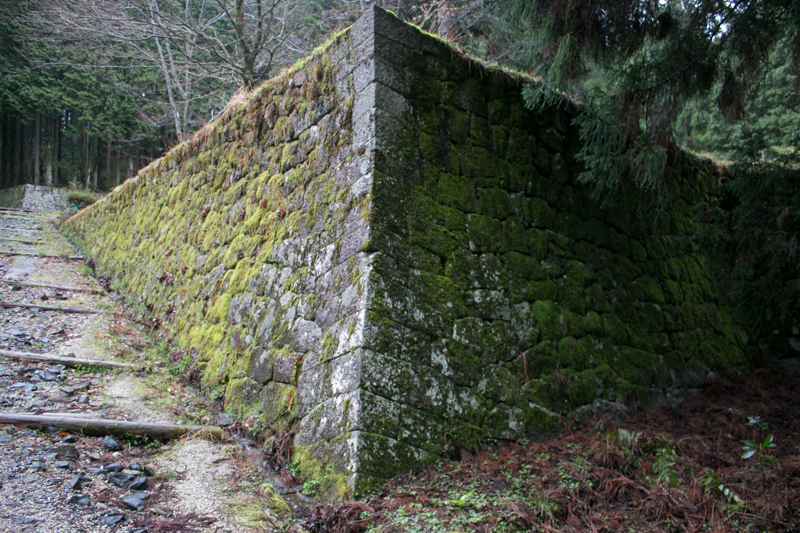 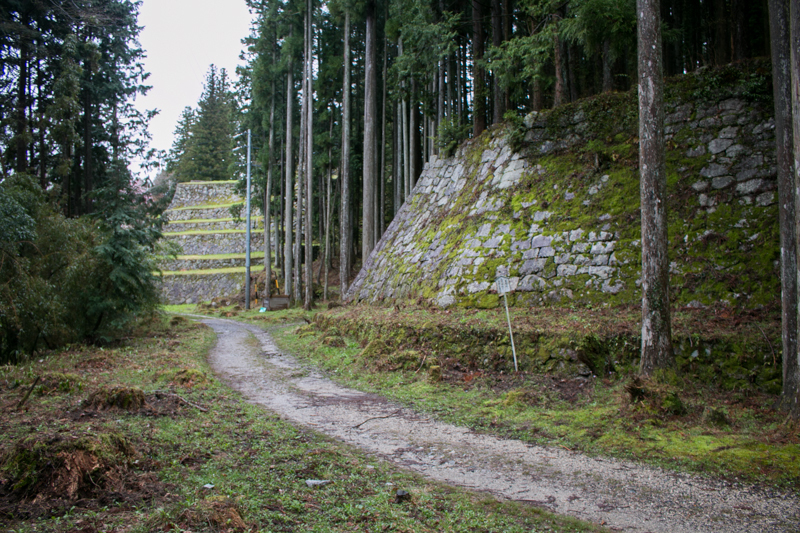 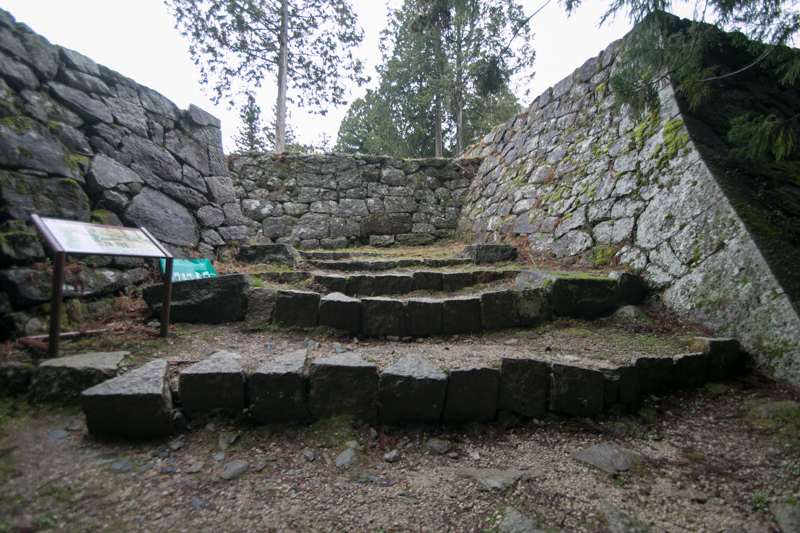 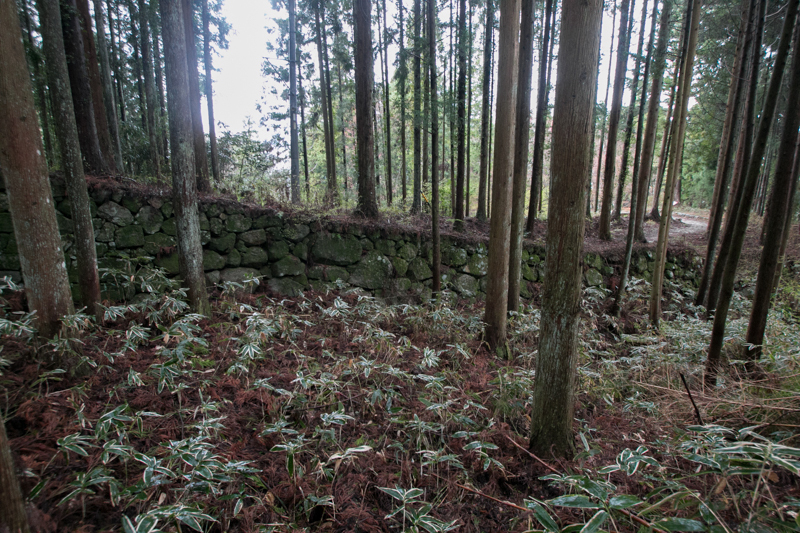 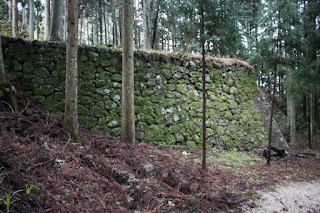 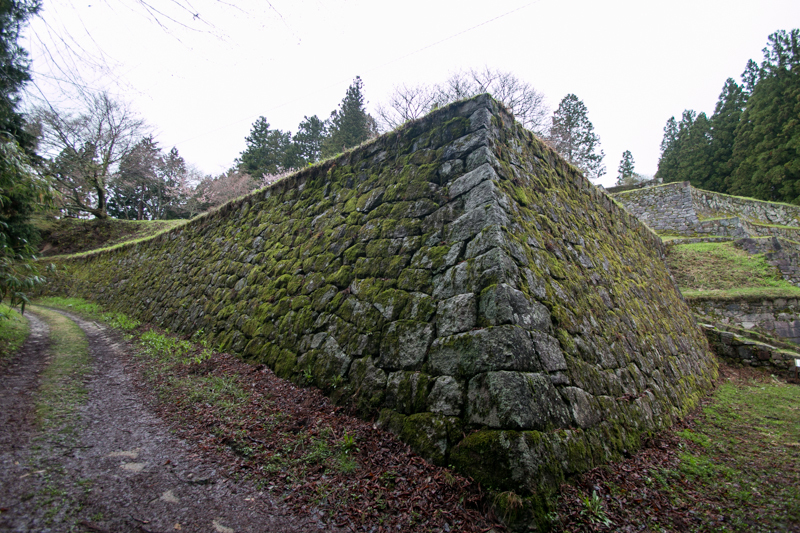 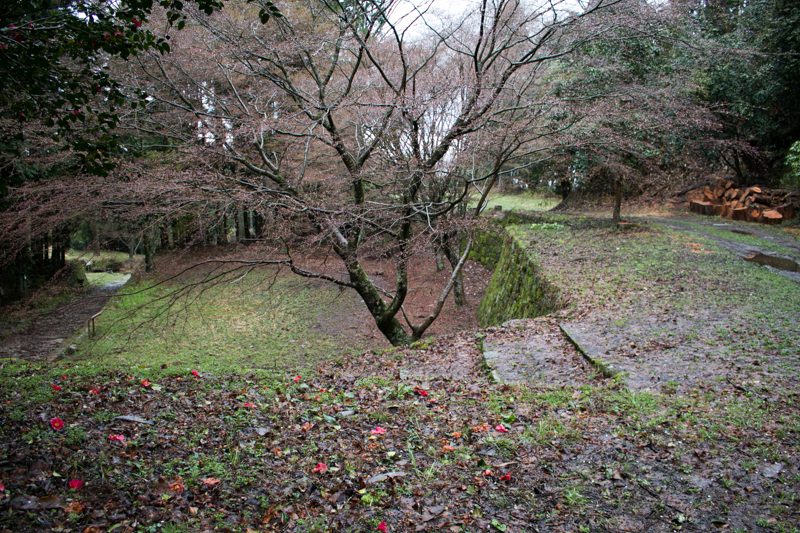 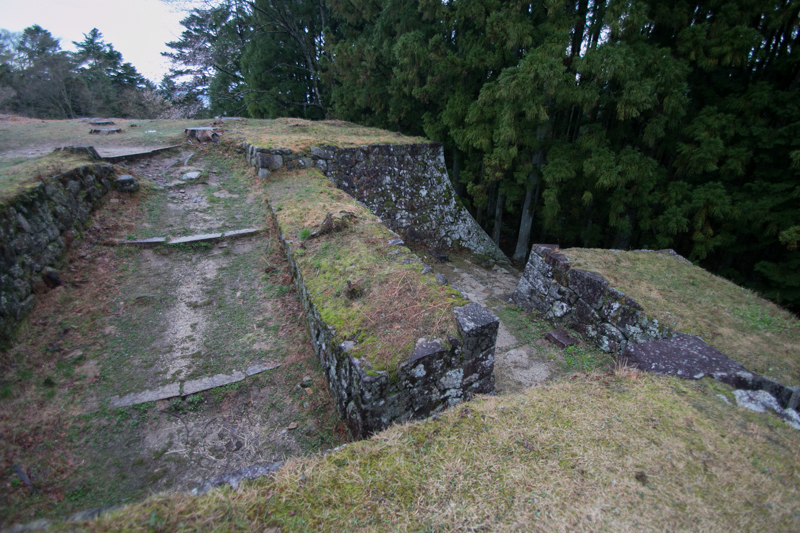 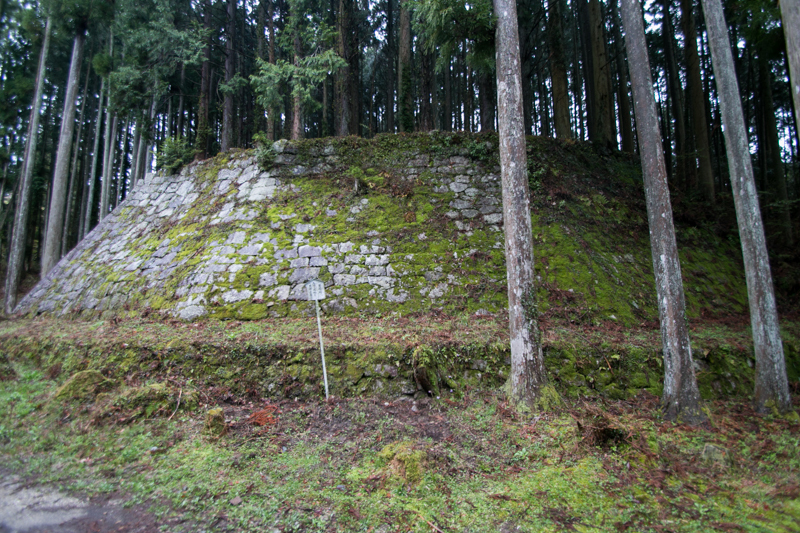 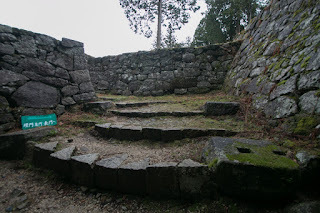 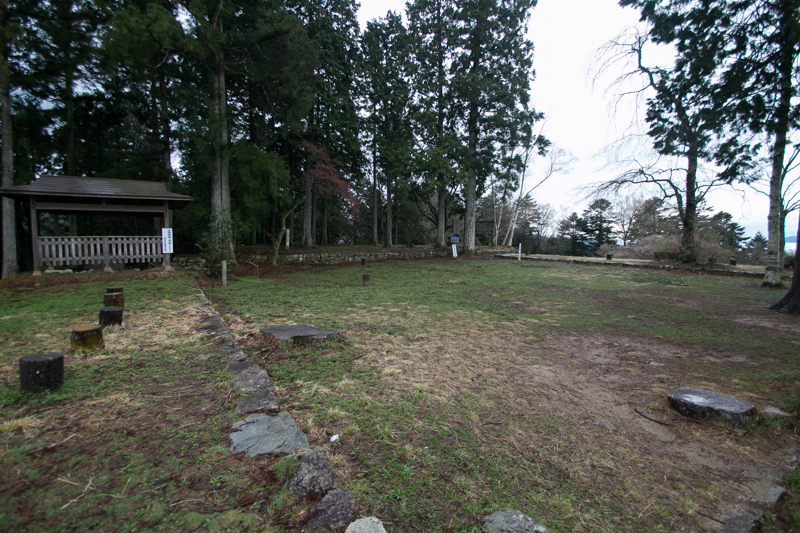 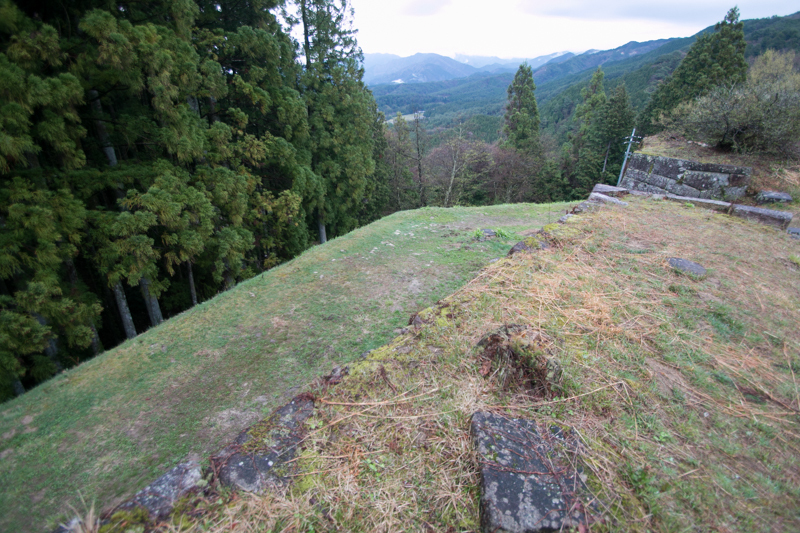 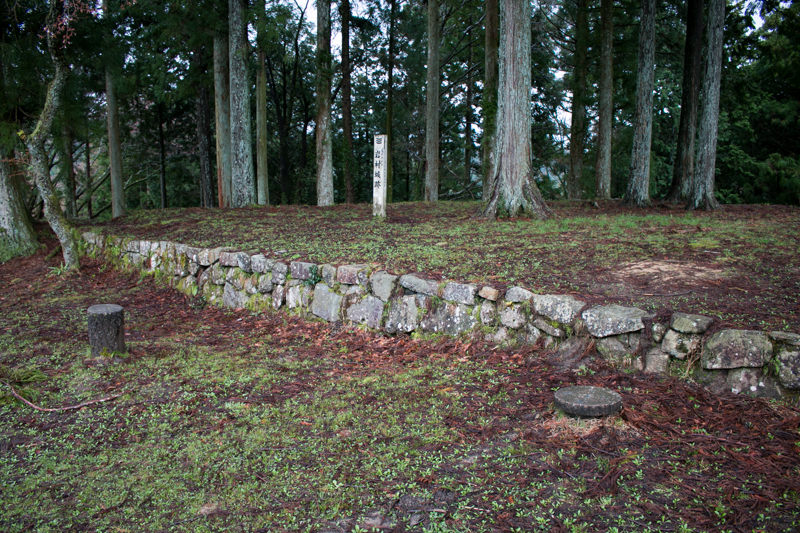 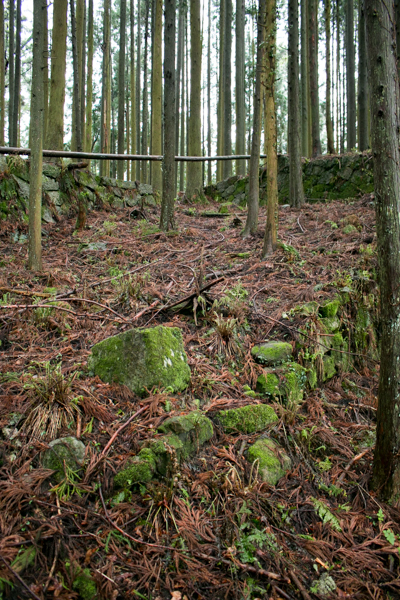 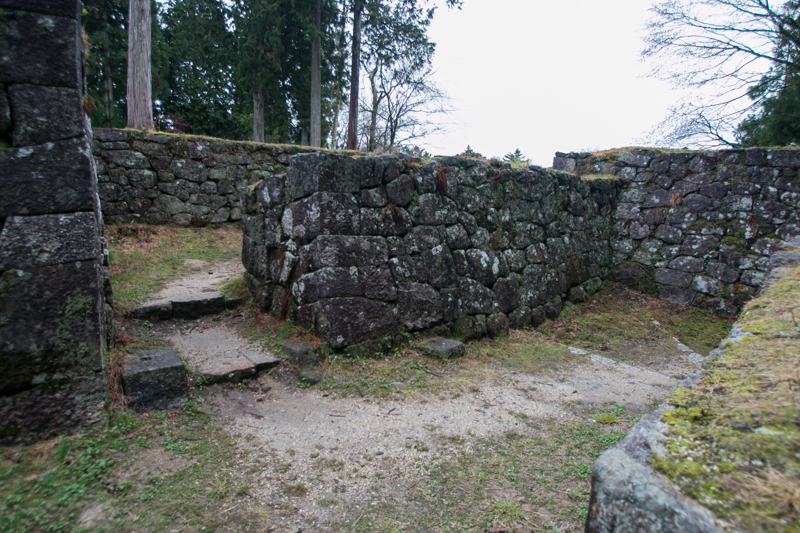 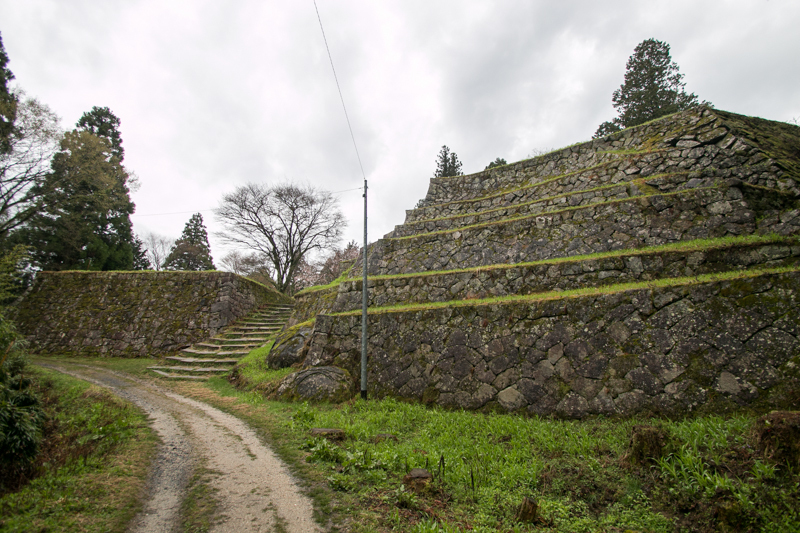 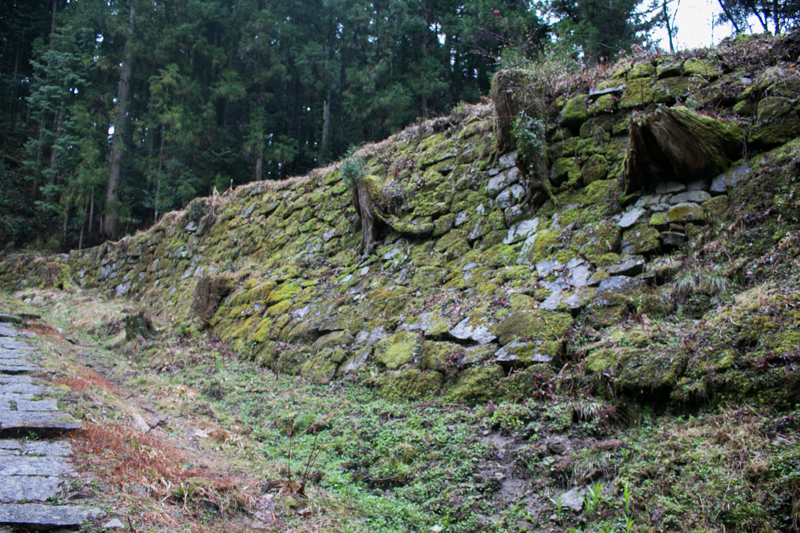 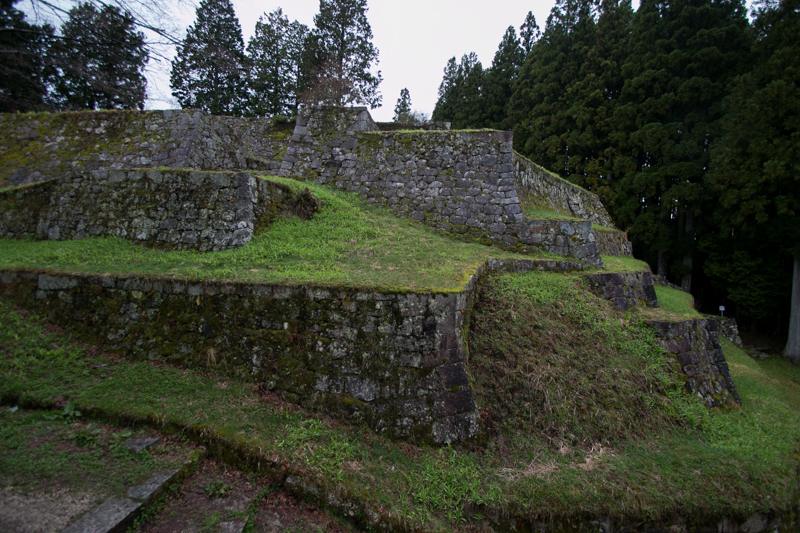 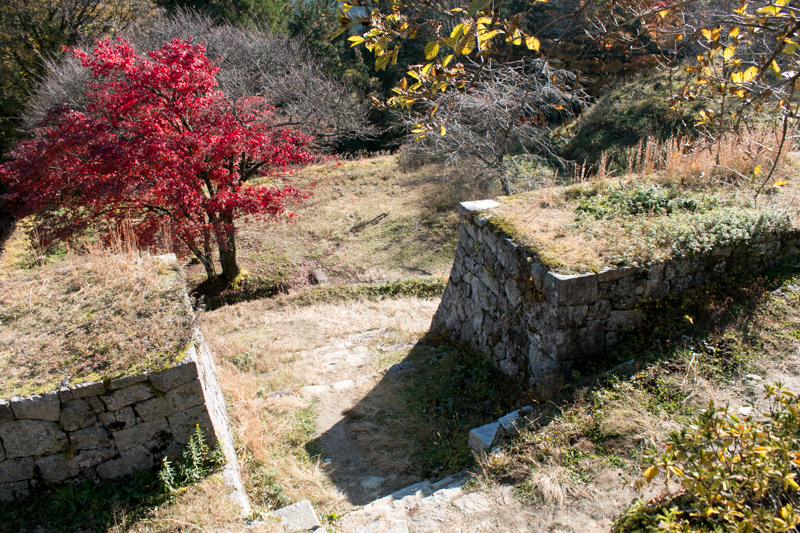 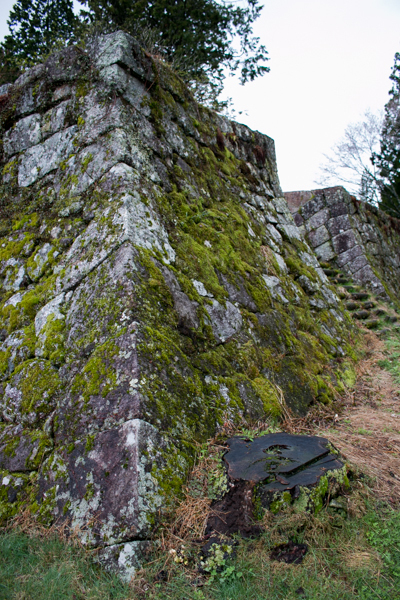 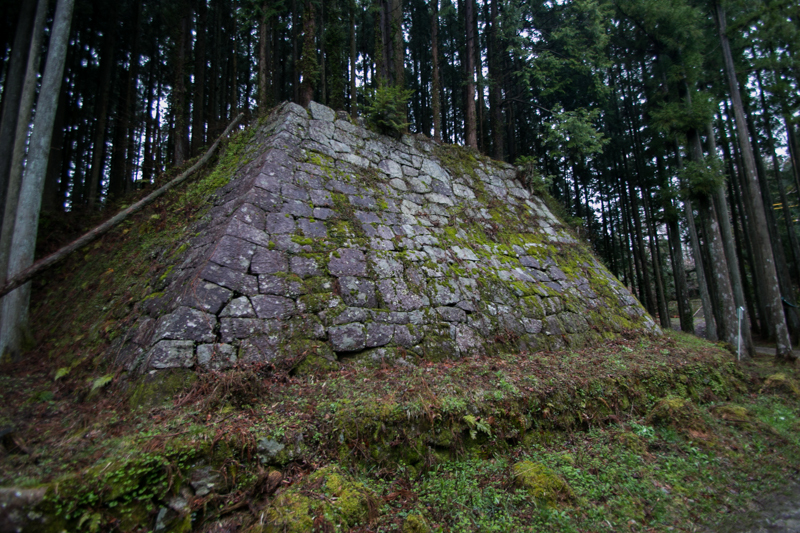 Precise year of construction is unknown but current Iwamura castle might be made in the former half of 16th century. Toyama clan had a certain power but was strongly affected by surrounding warlords in the mid of 16th century. 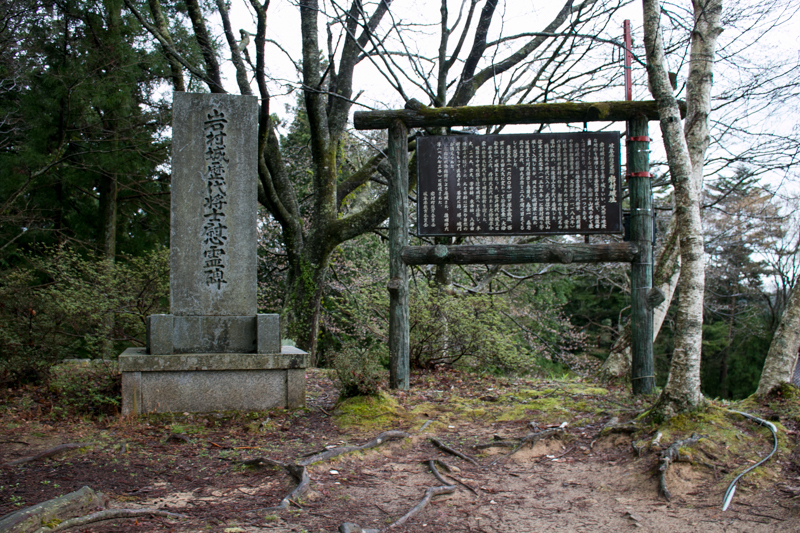 In 1545, Shingen Takeda (1521-1573), a warlord of Kai country (Yamanashi country) captured Ina region at the south of Shinano country, and in 1555, Kiso clan at Kiso valley was also forced to subordinate to Shingen. 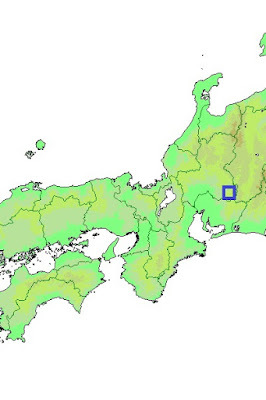 Considering this situation, Toyama clan once belonged to Takeda clan. 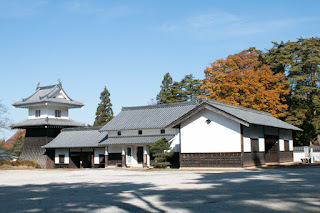 On the other hand, Nobunaga Oda (1534-1582), a warlord of Owari country (Aichi prefecture), aggressively built relationship with Toyama clan from his early period, probably to restrain Yoshitatsu Saito (1527-1561), governor of Mino country and his enemy. Nobunaga let Kagetou Toyama (1537?-1573), current leader of Iwamura Toyama clan, marry with Otsuya-no-kata (?-1575), an aunt of Nobunaga. 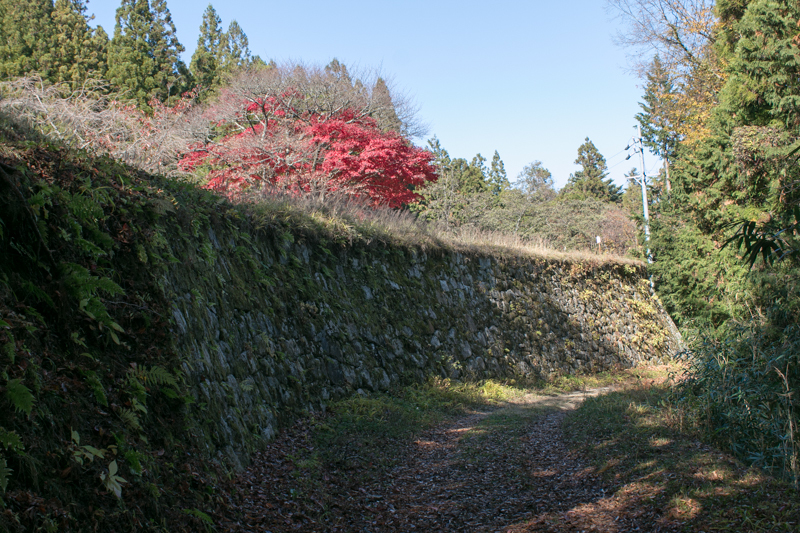 Further because there was no son between them, Nobunaga sent his sixth son Katsunaga (1570-1582) as an adopted son of Toyama clan. Around 1565 Nobunaga expanded his power to eastern Mino country in earnest. At first Nobunaga and Shingen made alliance to aim at their target, Kinki region for Nobunaga and Suruga province for Shingen. 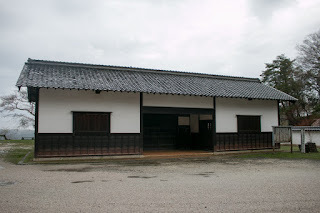 Toyama clan coordinated this friendship, and Nobunaga made a daughter of Naokado Toyama of Naeki Toyama clan as his adopted child and let marry with Katsuyori Takeda (1546-1582), successor of Shingen. 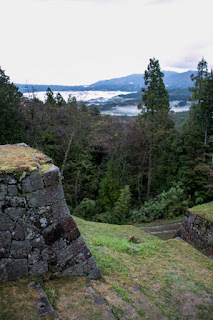 After her death, Nobunaga and Shingen agreed a marriage between their son and daughter. 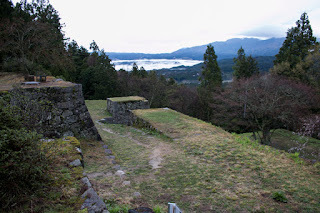 But in 1572, Shingen who captured Suruga country, next aimed at territories of Nobunaga and Ieyasu Tokugawa (1543-1616), an ally of Nobunaga, and started campaign against them. 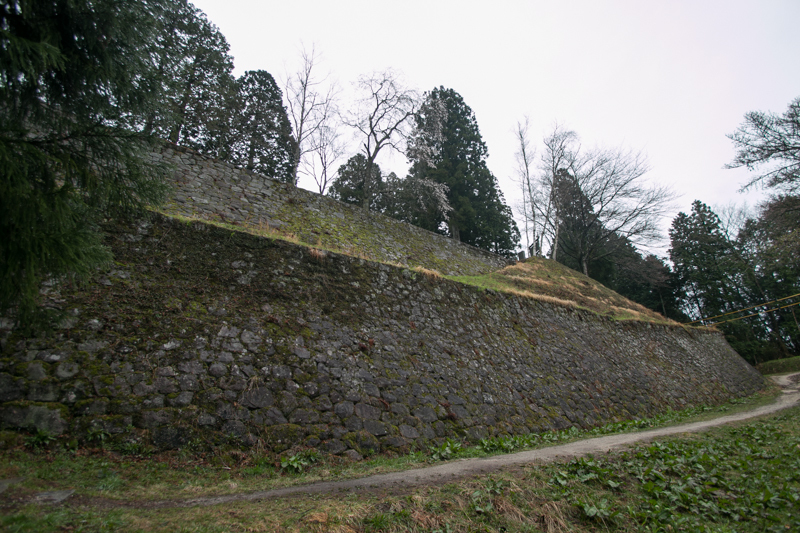 In this year Torashige Akiyama (1531-1575, famous as Nobutomo) attacked Iwamura castle, and Kagetou barely drove back this assault but injured in the battle and died. 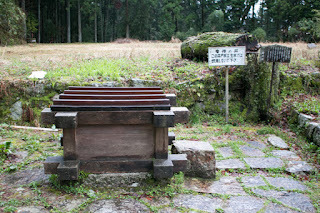 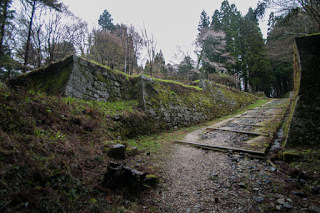 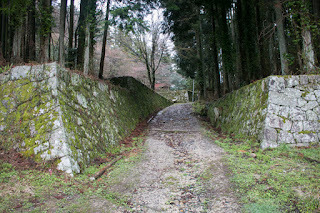 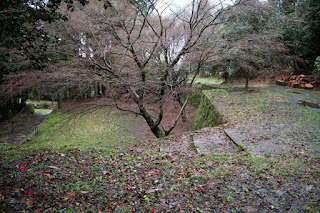 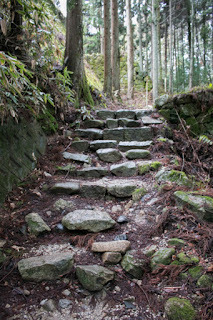 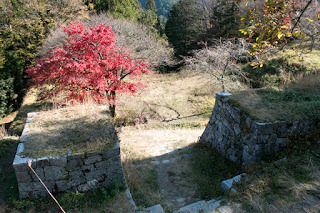 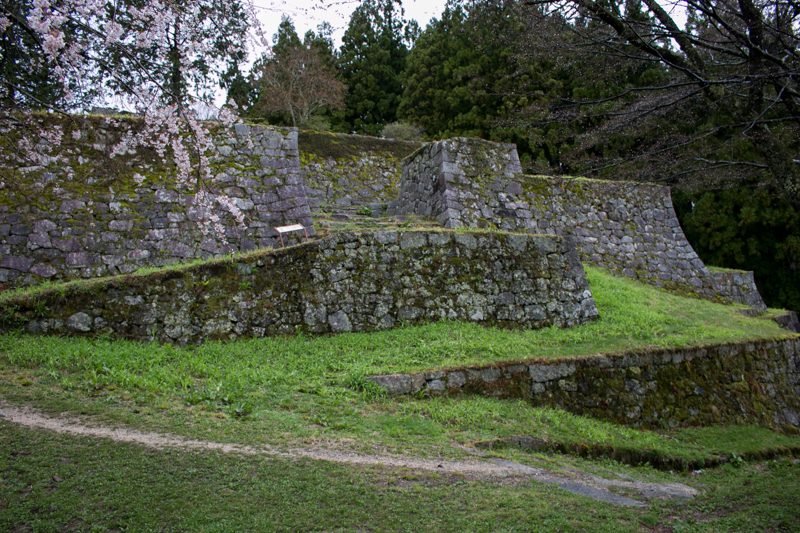 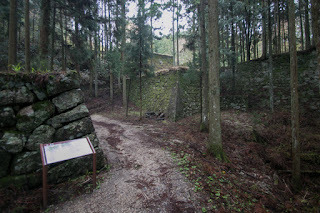 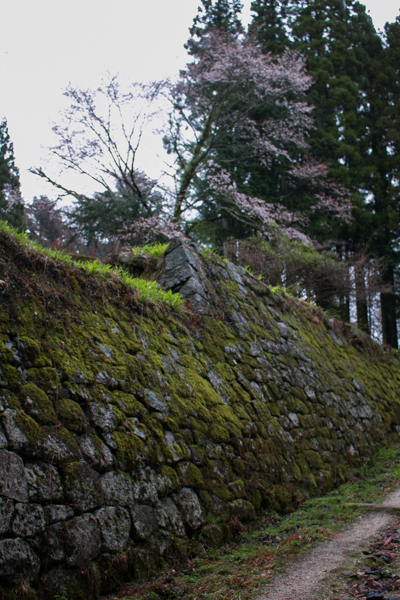 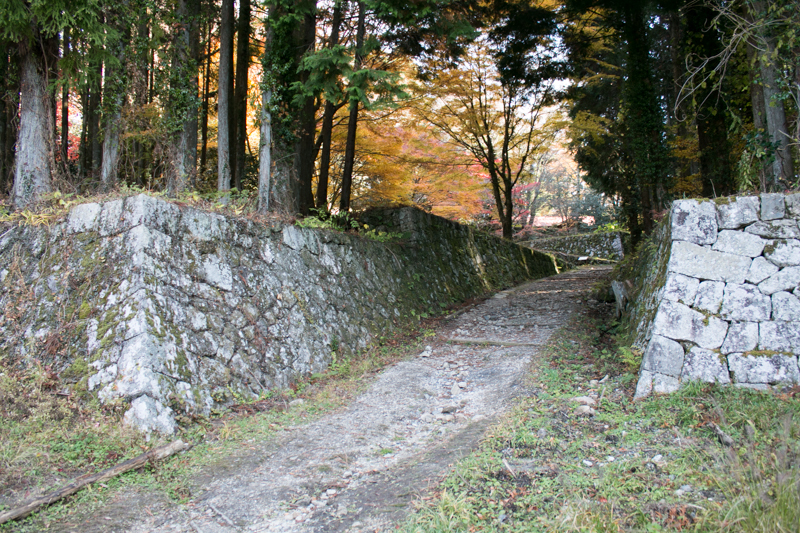 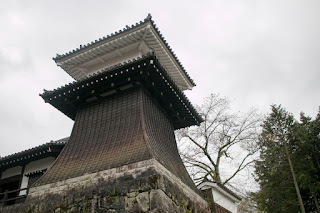 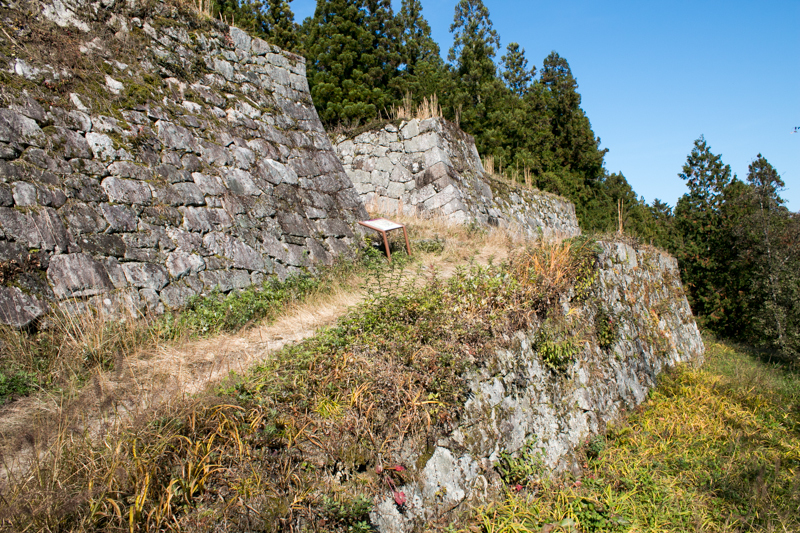 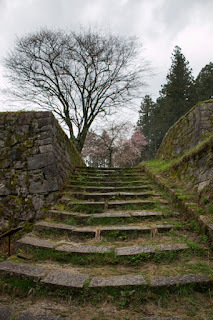 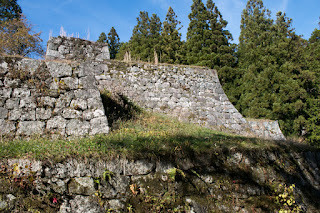 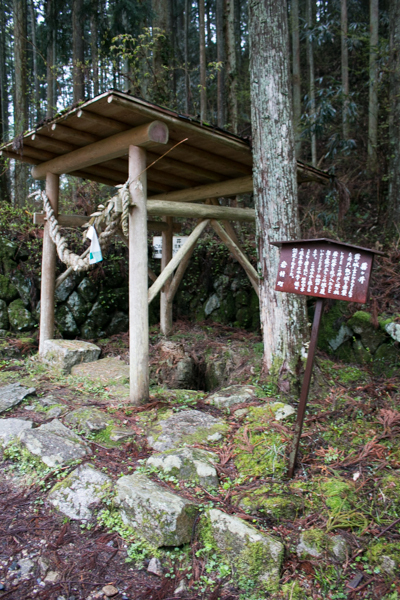 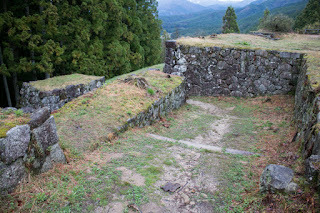 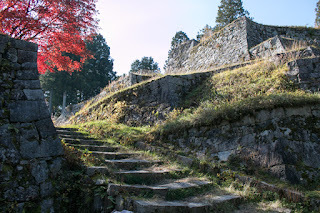 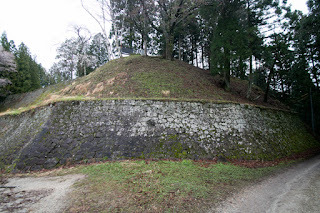 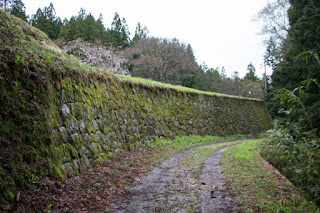 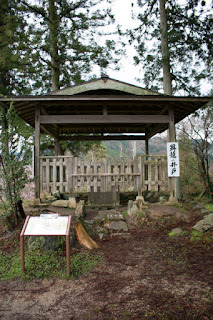 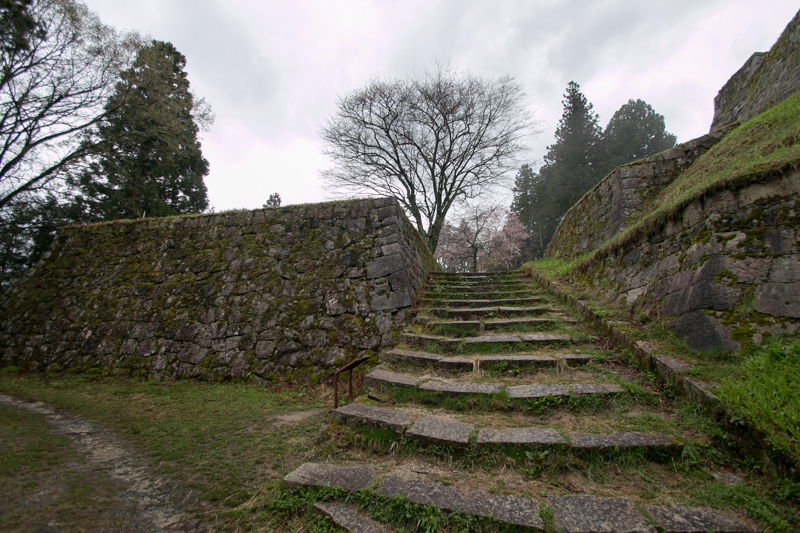 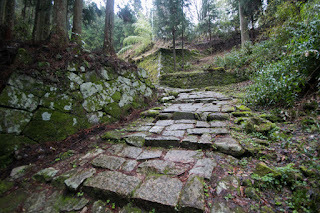 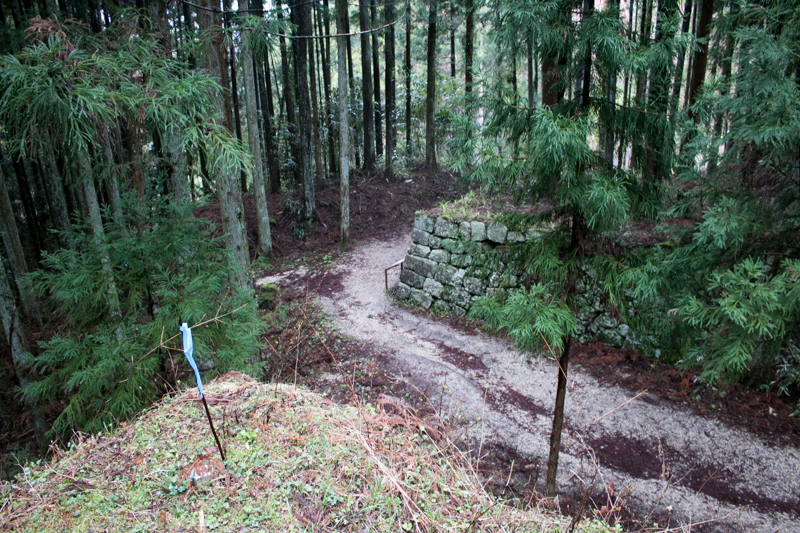 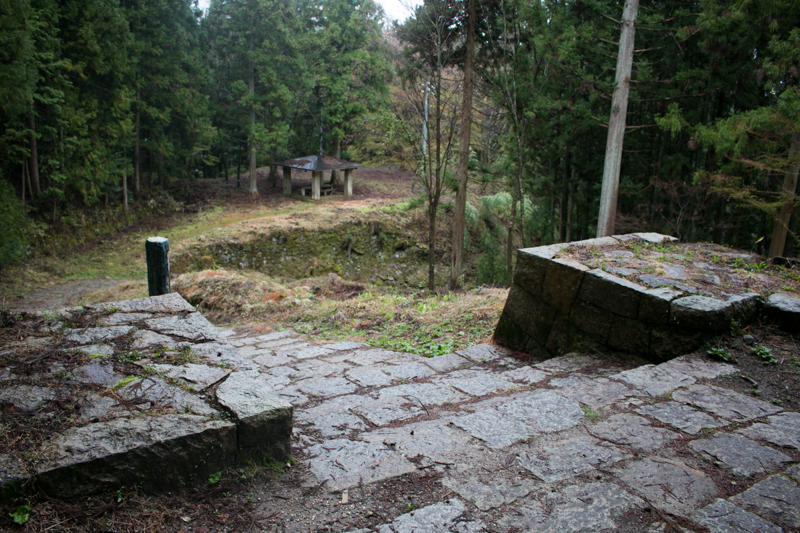 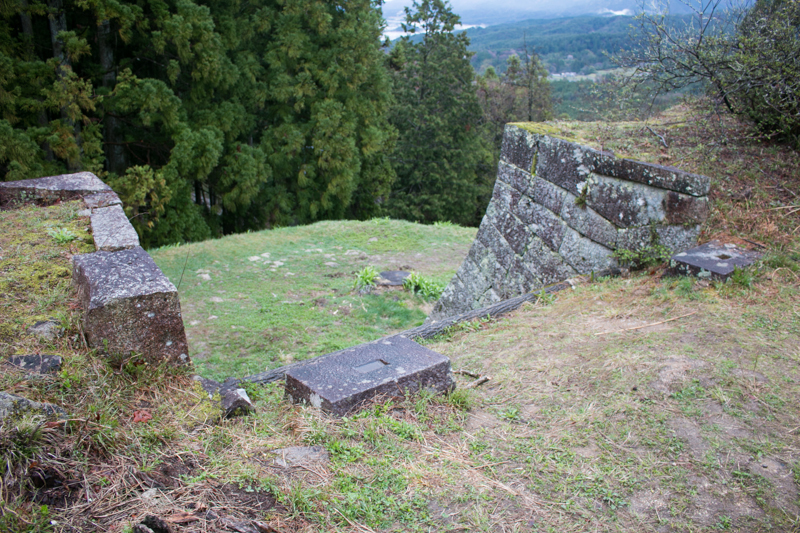 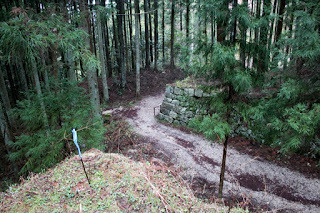 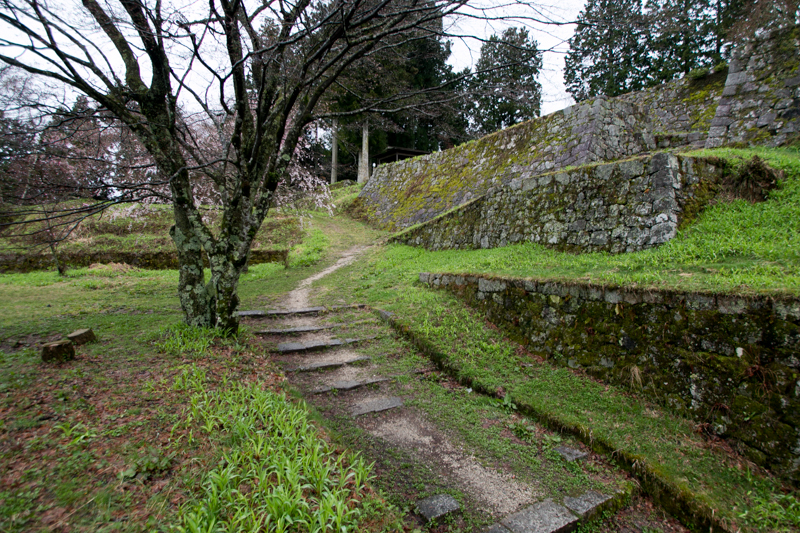 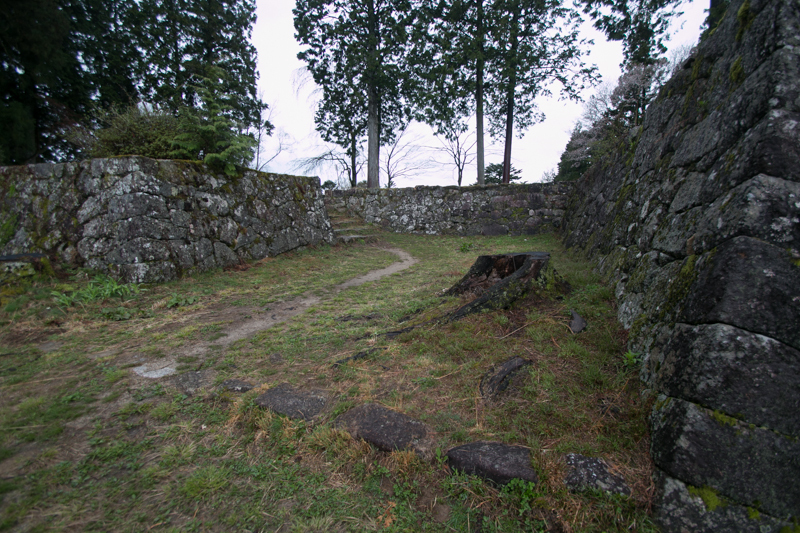 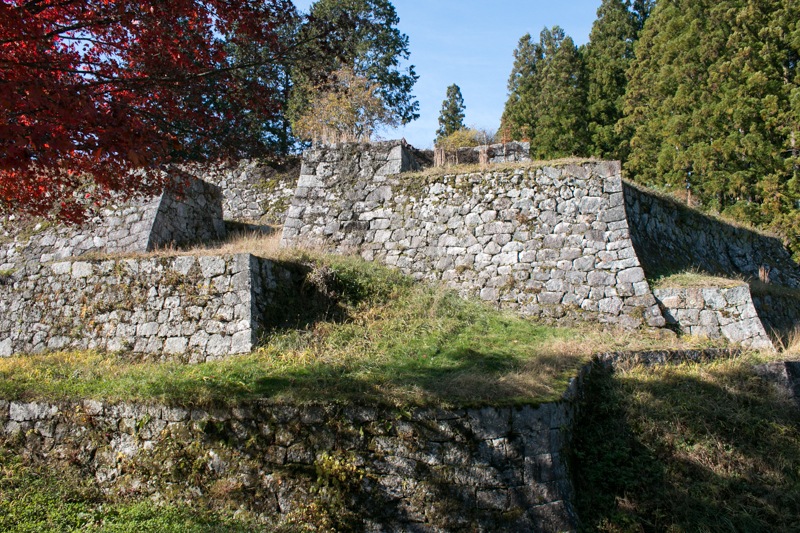 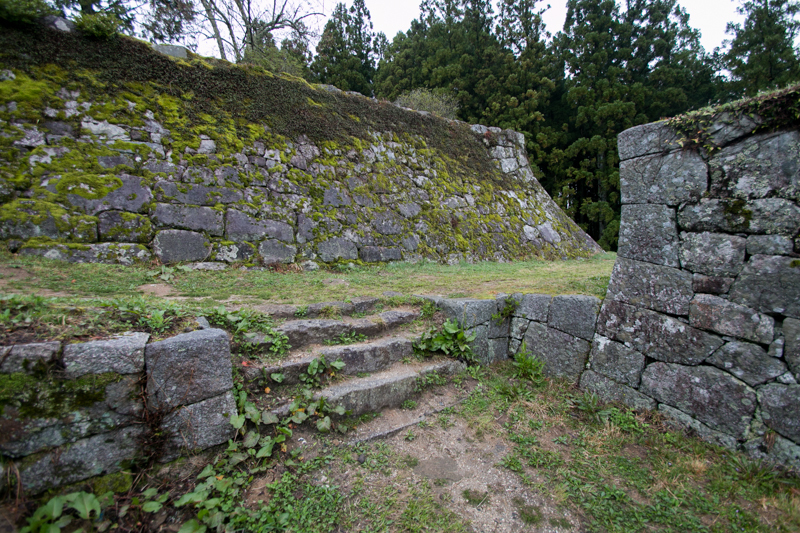 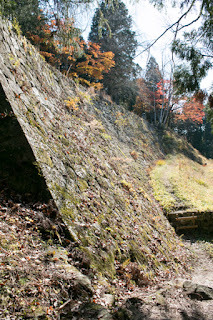 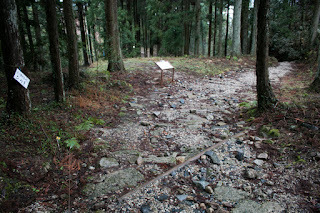 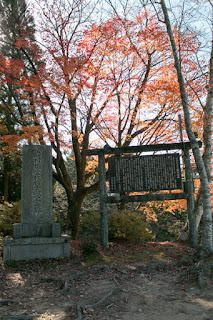 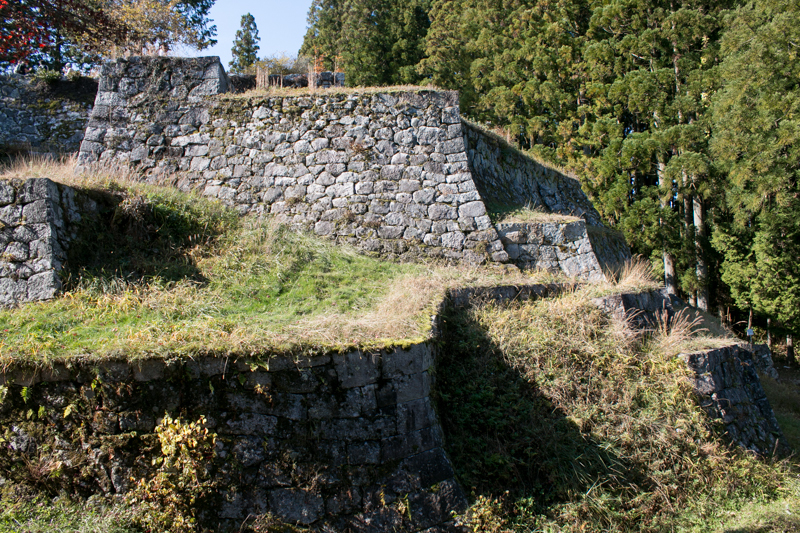 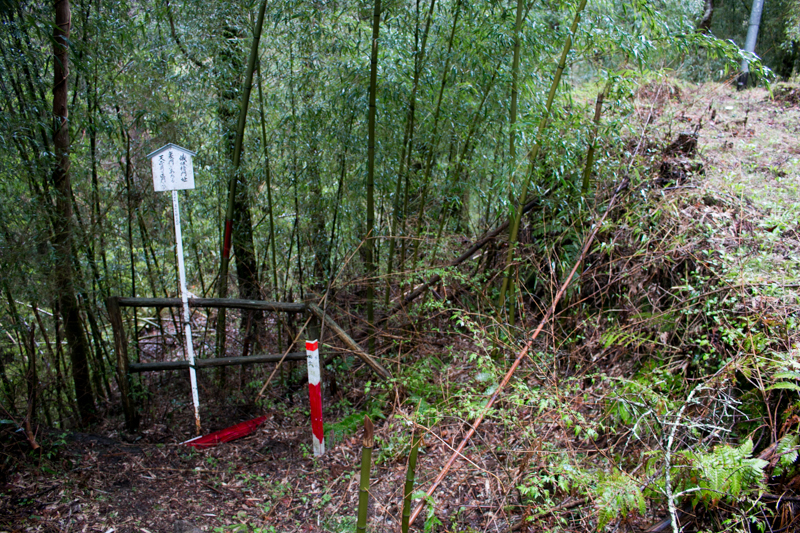 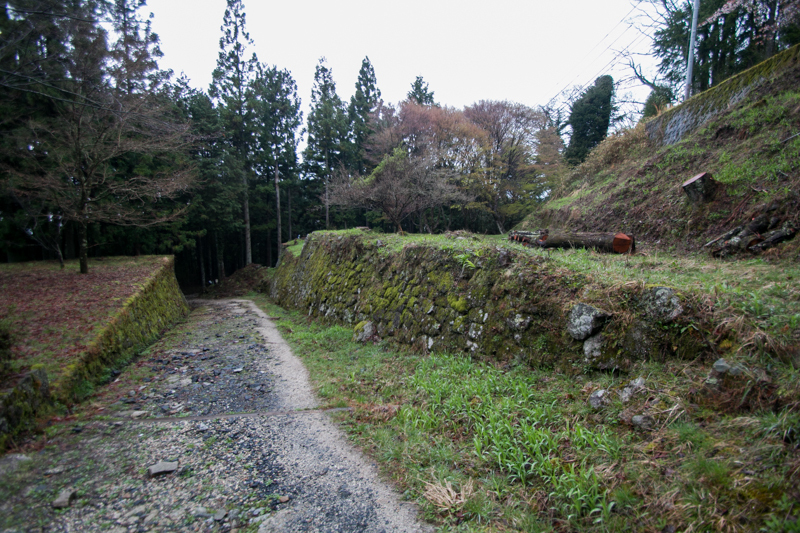 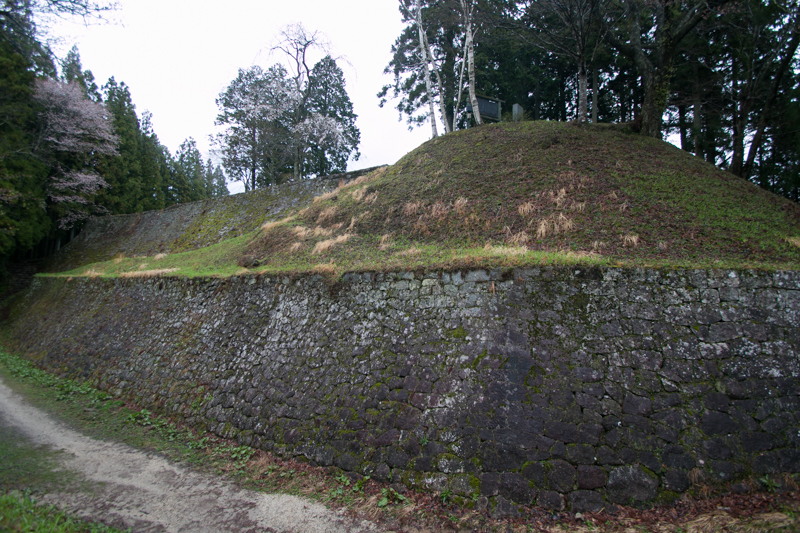 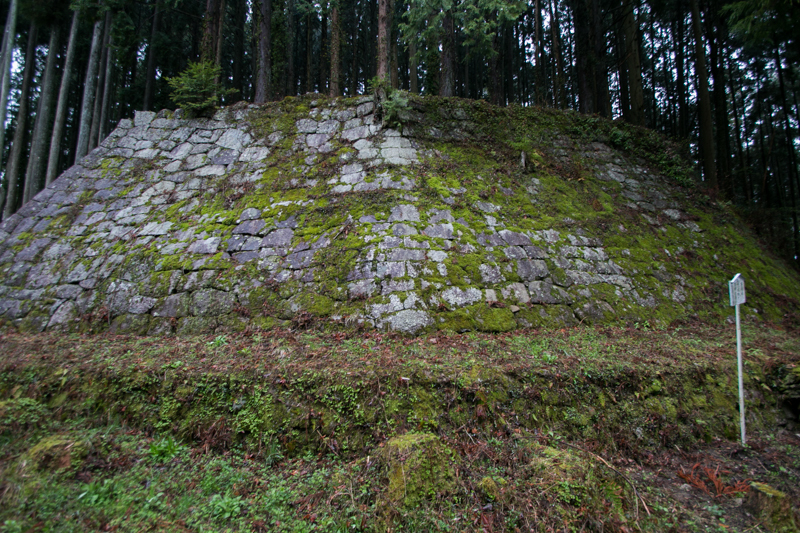 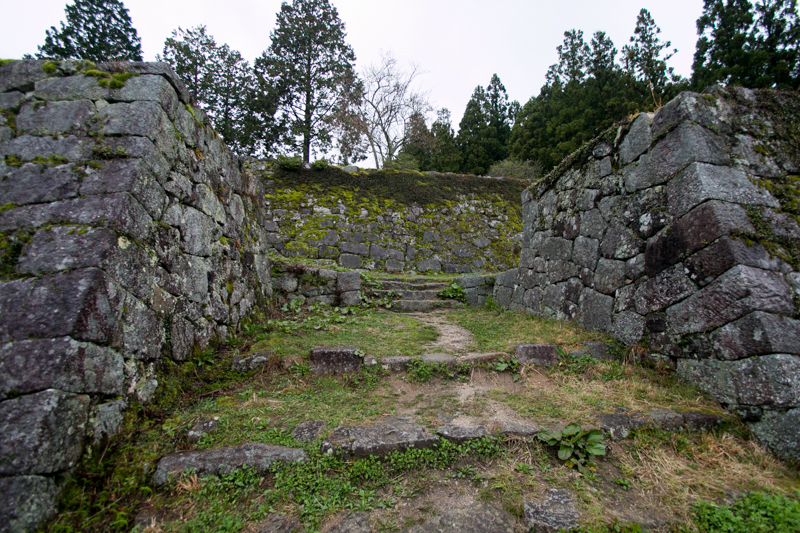 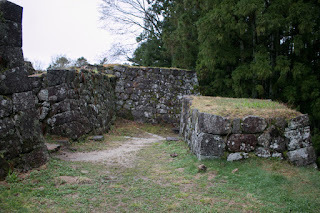 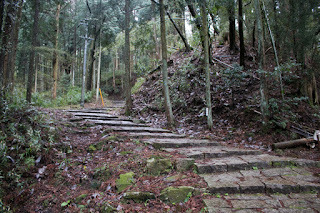 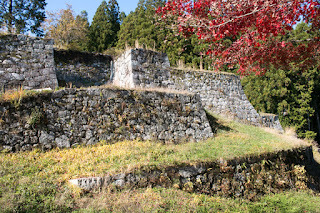 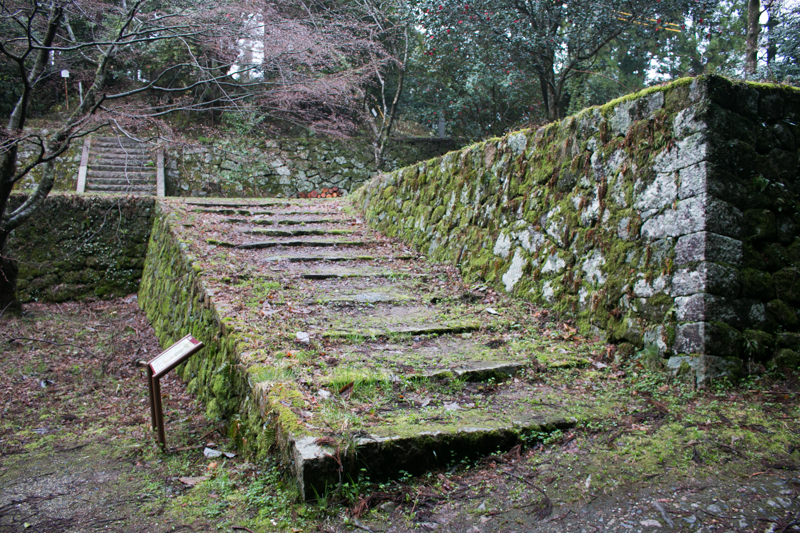 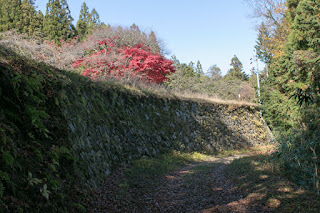 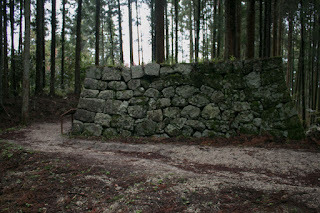 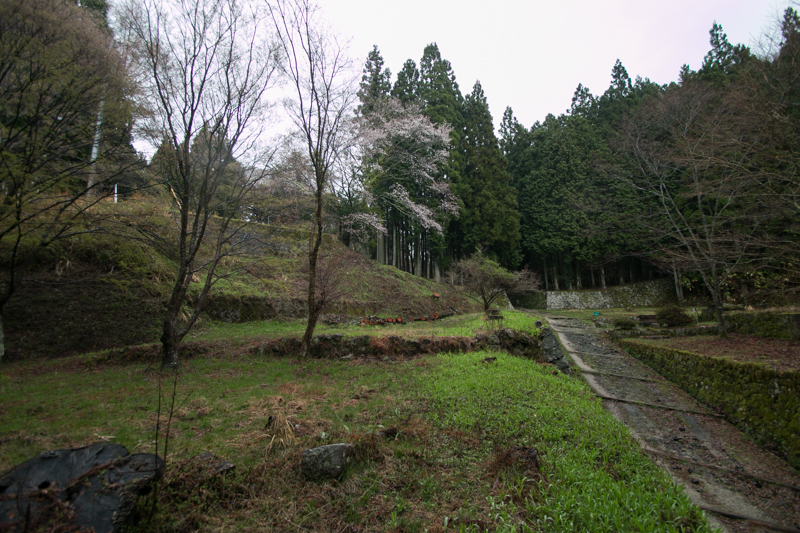 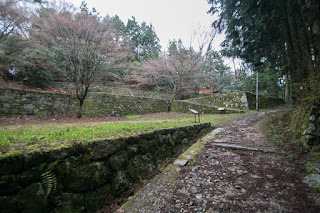 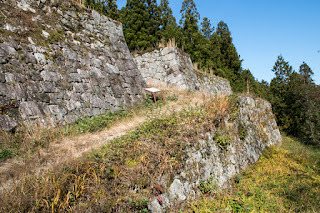 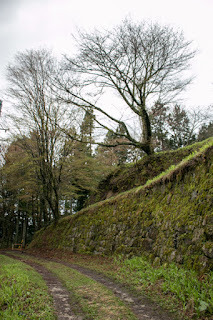 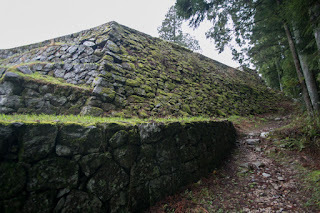 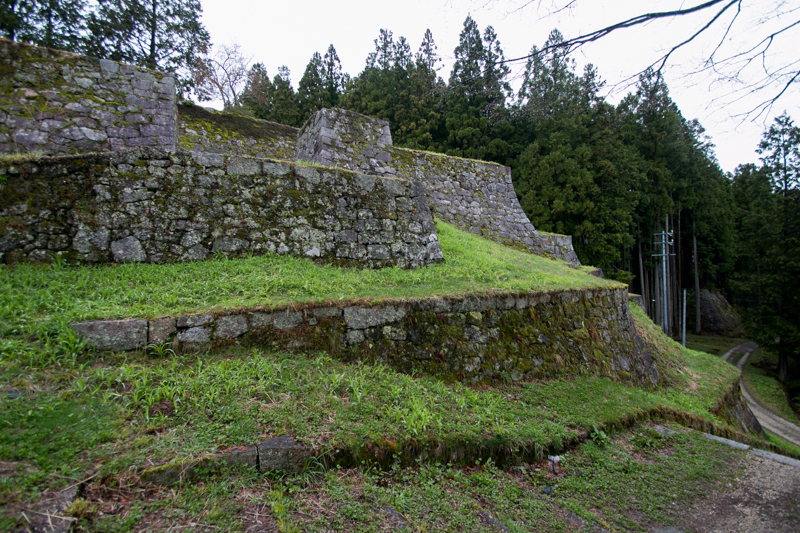 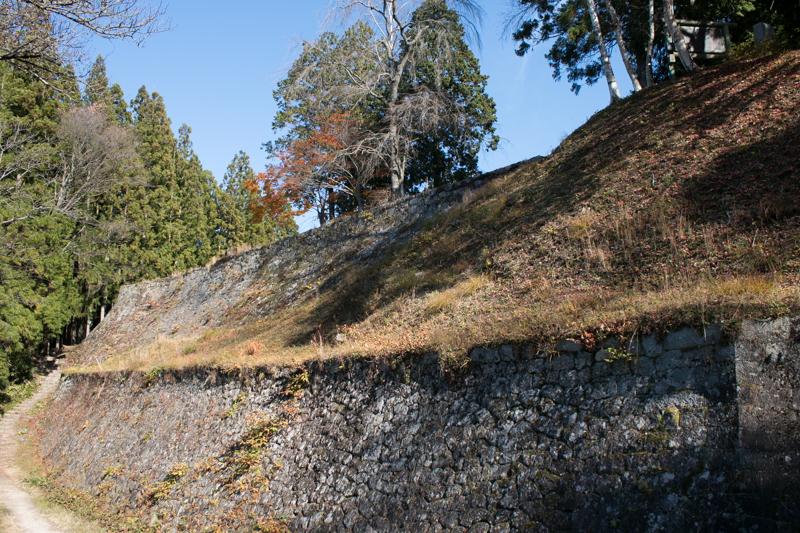 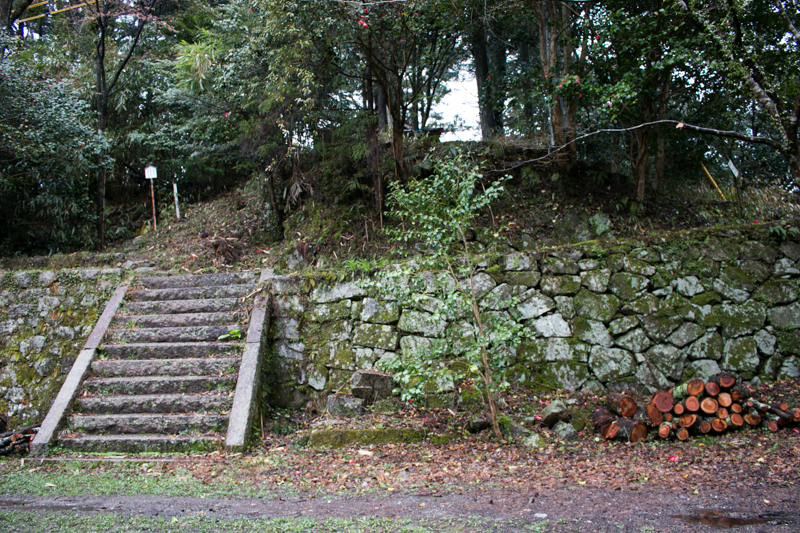 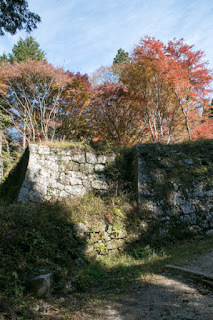 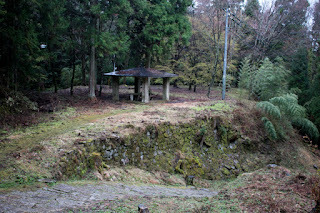 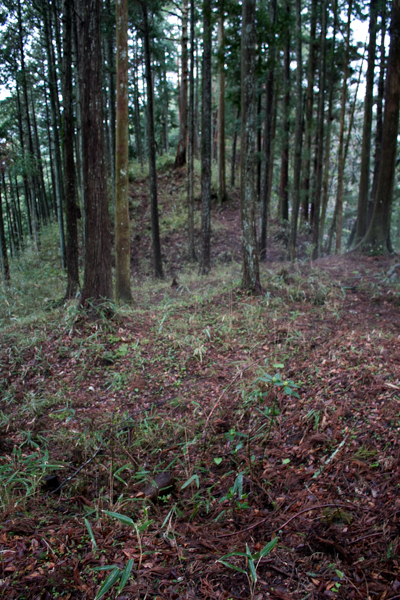 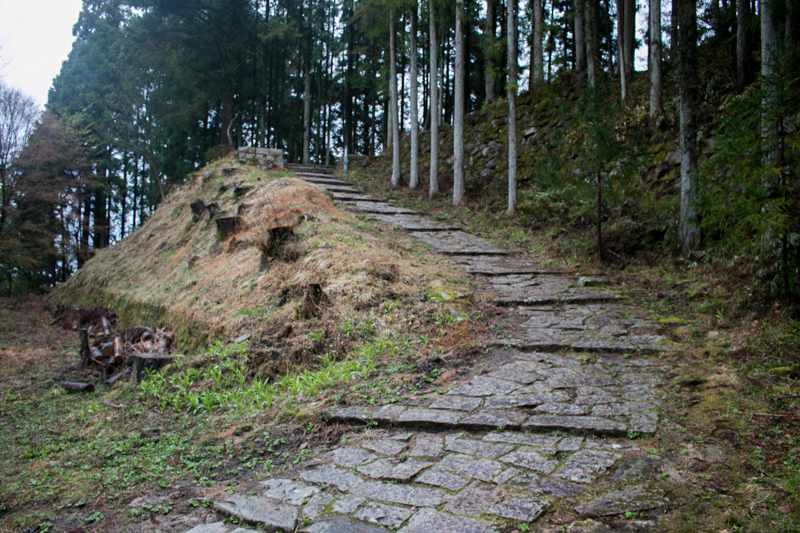 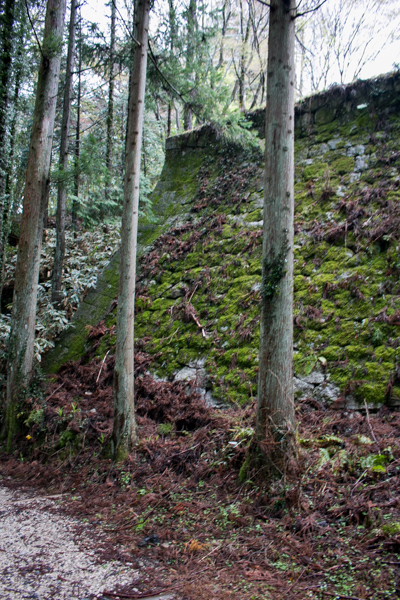 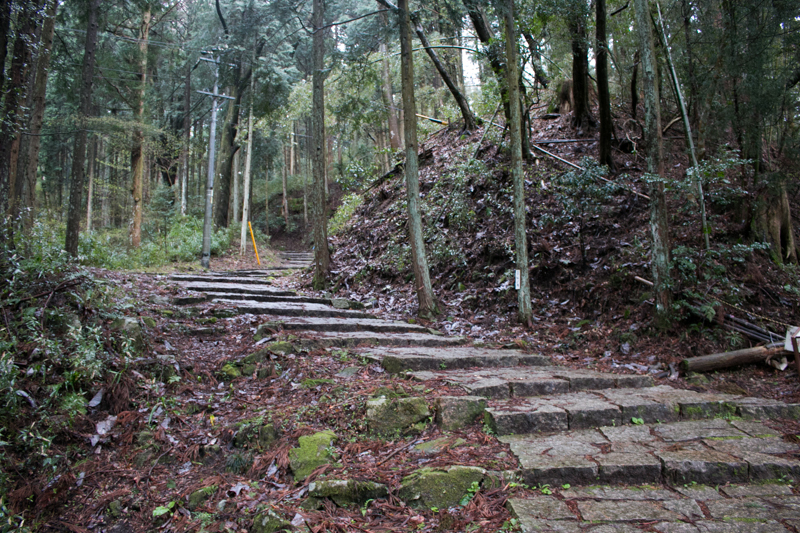 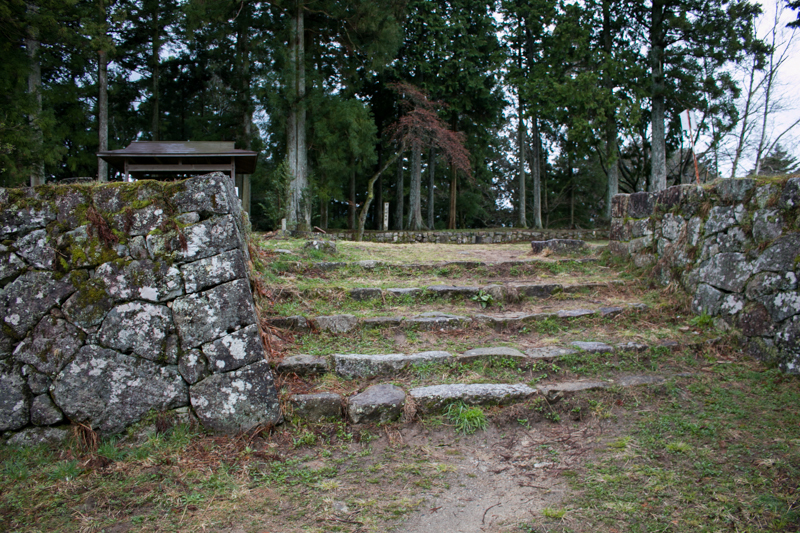 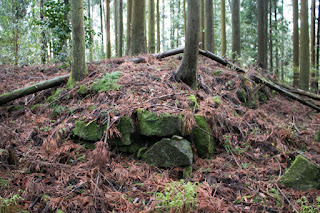 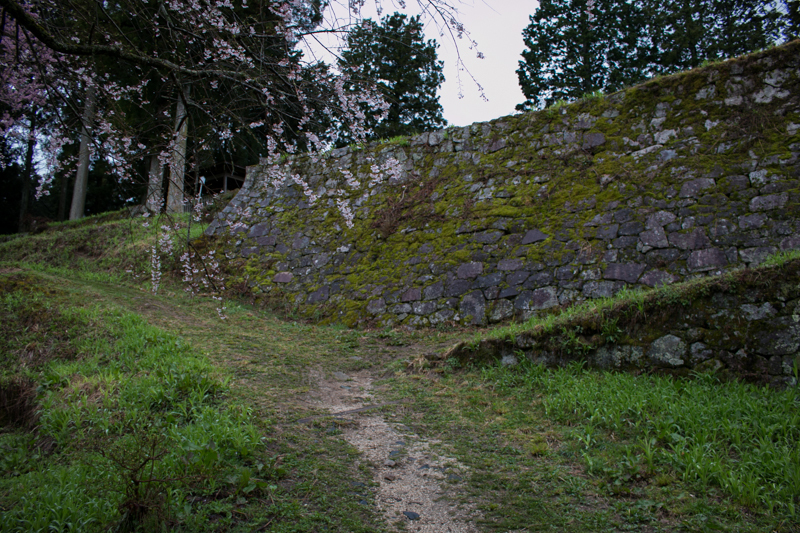 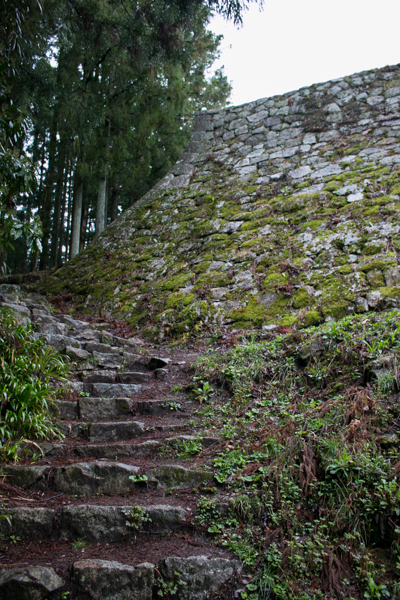 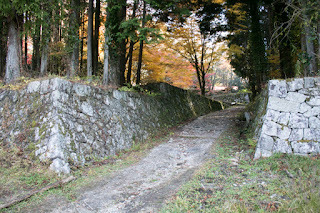 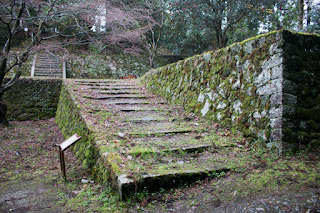 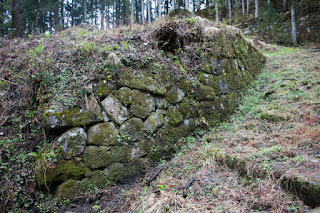 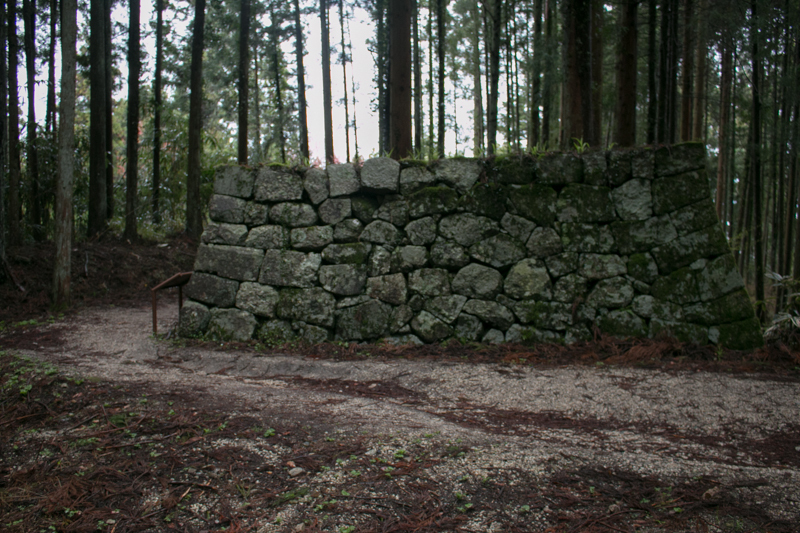 Succeeding her husband Otuyanokata became the commander, but utilizing this chance Torashige sieged Iwamura castle again. 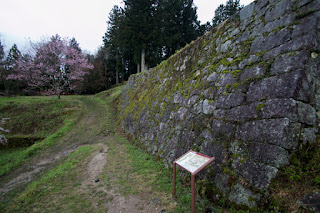 Castle fought well but due to low moral of soldiers after the death of Kagetou and defeat of reinforcement army from Oda clan, Otsuyanokata finally decided to surrender to Torashige under the condition of marrying with Torashige. 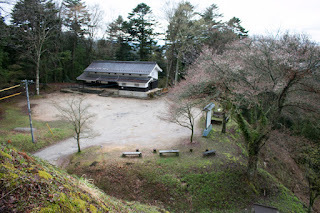 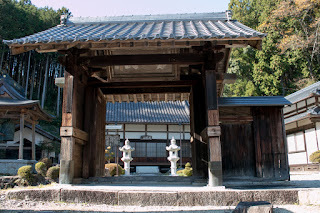 In this way Iwamura Toyama clan and Iwamura castle belonged to Takeda clan, and Katsunaga was sent to Takeda clan (later he was returned to Oda clan but died at the accident of Honnoji). 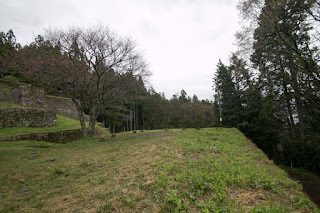 In the meantime, Shingen died in 1573 and his successor Katsuyori Takeda (1546-1582) was defeated by Nobunaga at the battle of Nagashino in 1575, then Takeda clan began to decline. 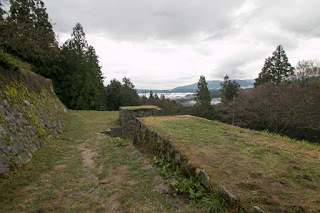 Nobunaga planned to retrieve Iwamura castle, and let his son Nobutada Oda (1557-1582) siege the castle with 30,000 solders. Facing overwhelming army Torashige and Otsuyanokata stood well, but due to the defeat of reinforcement army from Katsuyori and shortage of supply, they finally decided to open the castle. 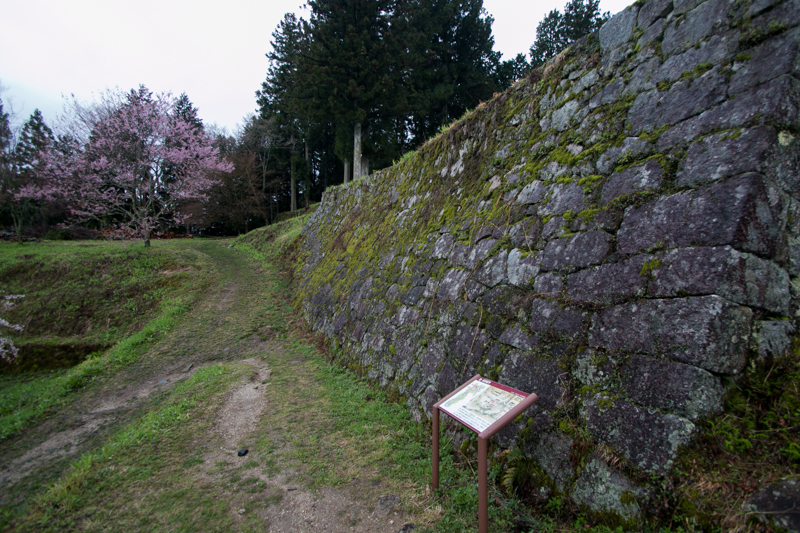 Nobunaga once accepted this condition but getting furious about betrayal of his relative, Nobunaga executed Torashige and Otsuyanokata. Remaining people of Iwamura Toyama clan were extinghished with the castle, and Iwamura Toyama clan disappeared from the history. 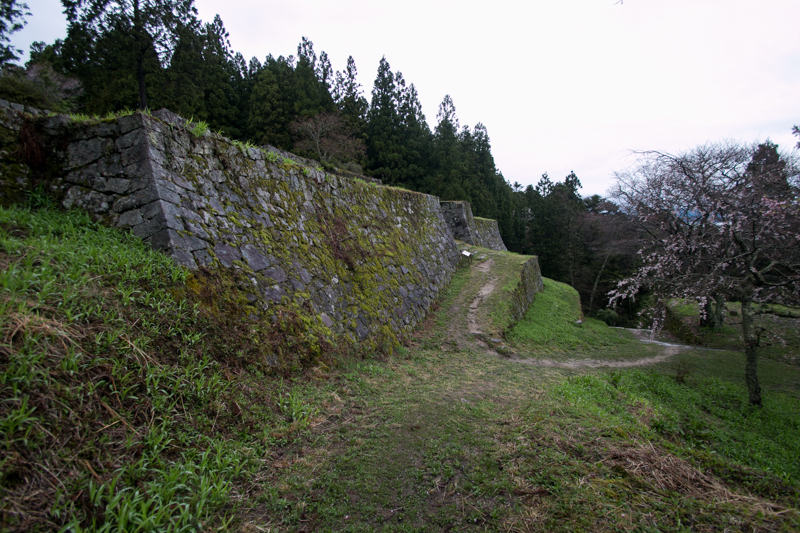 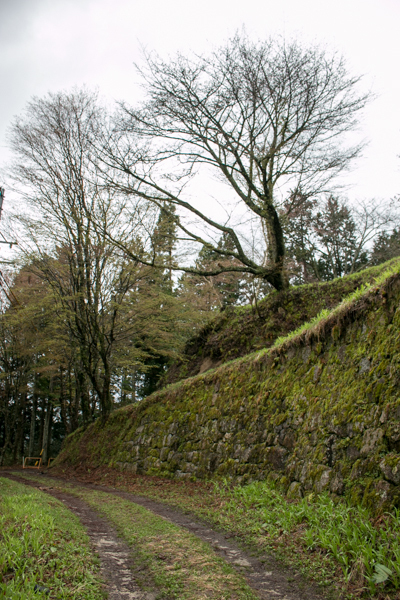 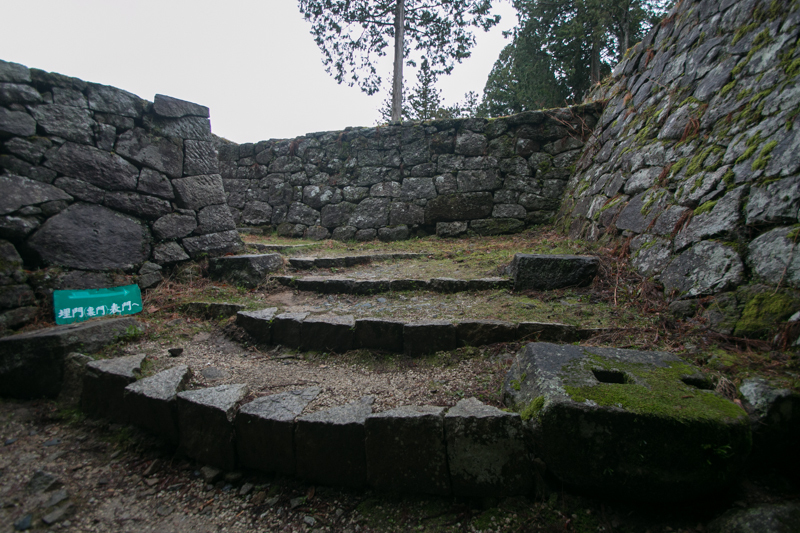 After the fall, Iwamura castle was given to Mori clan at Kaneyama castle and transformed into a modern castle surrounded by stone walls. 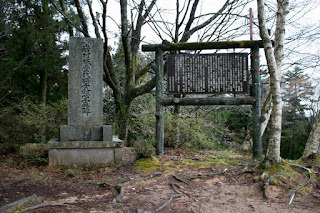 After the battle of Sekigahara in 1600, first shogun Ieyasu Tokugawa (1543-1616) appointed Ienori Matsudaira (1575-1614), leader of Ogyu Matsudaira clan, which is a branch family of Tokugawa clan. 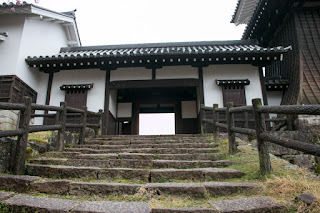 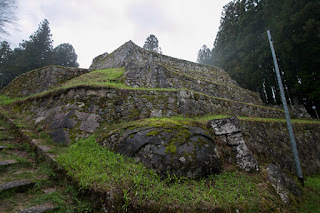 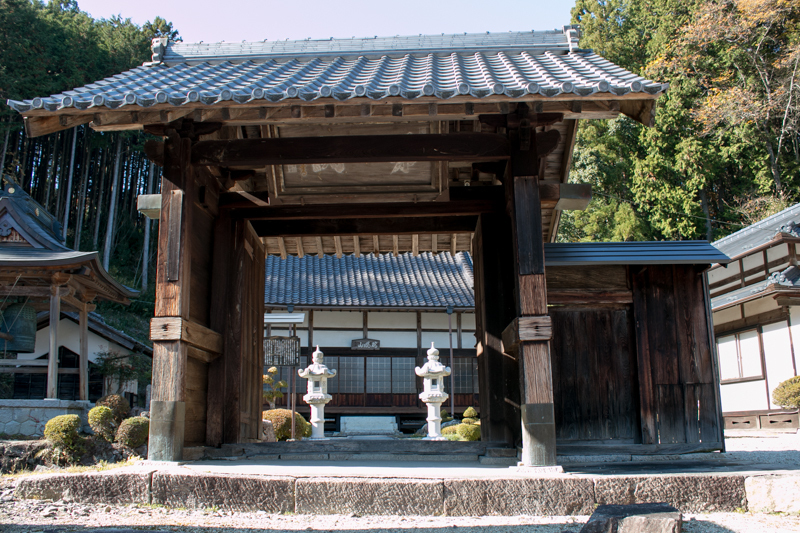 With the arrival of peace period Ienori newly built his palace at the foot of the mountain and normally stayed there, but buildings on the mountain were kept in case of accident. 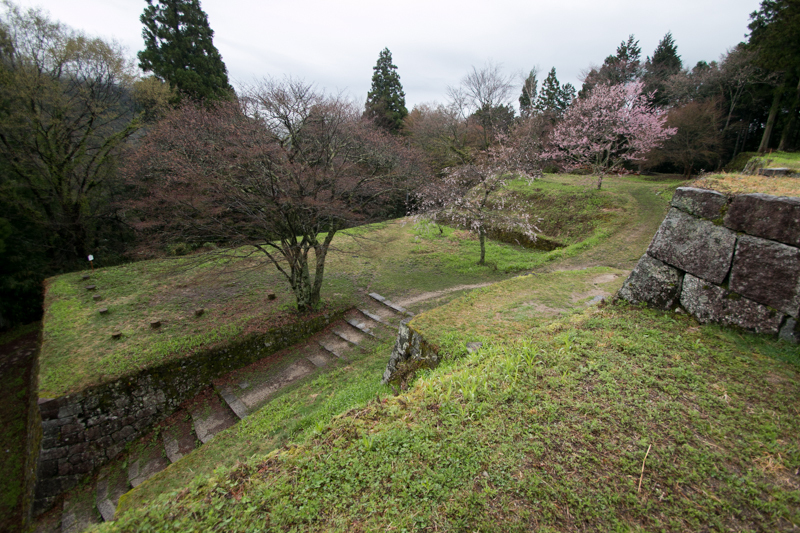 Throughout Edo era, Iwamura castle was basically held by relative house of Edo shogunate, and kept a place of center of eastern Mino province. 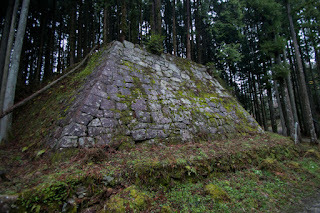 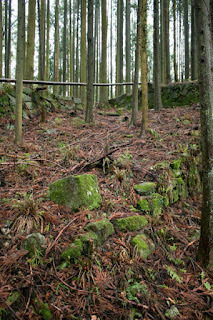 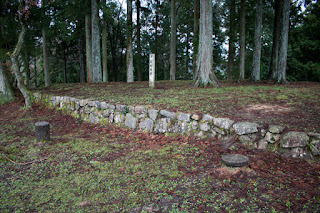 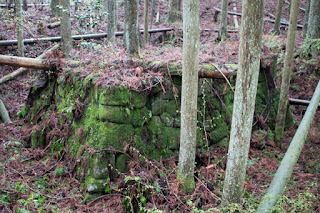 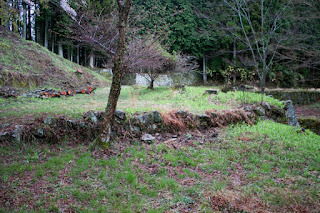 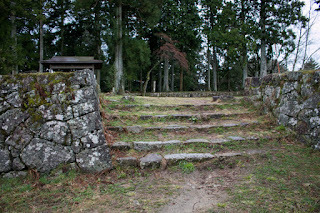 Subsequent to Meiji revolution all buildings were broken except for one gate moved to neighbor temple, but stone walls on the mountain remain well and remind us tragic female commander of this castle. 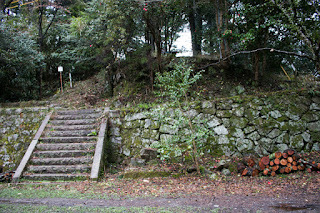 20 minutes walk to hillside entrance from Akechi Tetsudo line Iwamura station (transfer at JR Chuosen line Ena station to Akechi Tetsudo line). 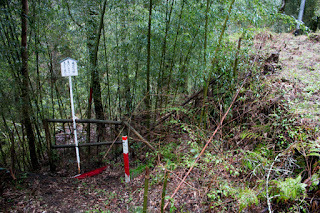 Another 30 minutes from hillside entrance to central area. 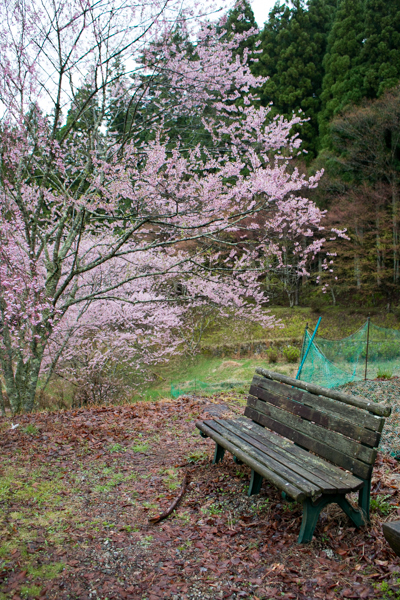 40 minutes drive from Chuo Expressway Ena interchange.